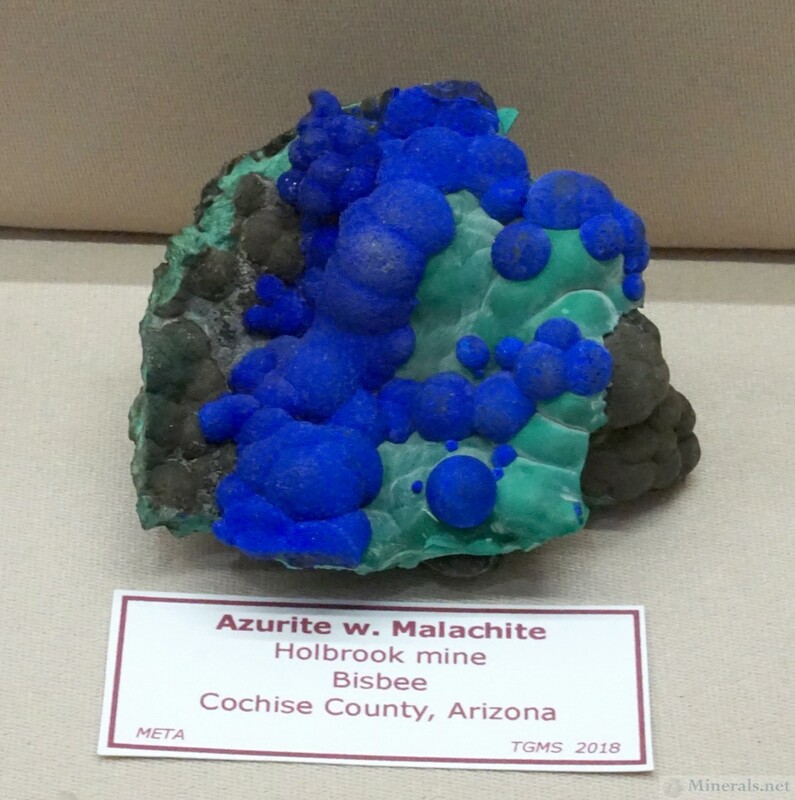 This post is a recap of our detailed coverage of this year's Tucson mineral events. 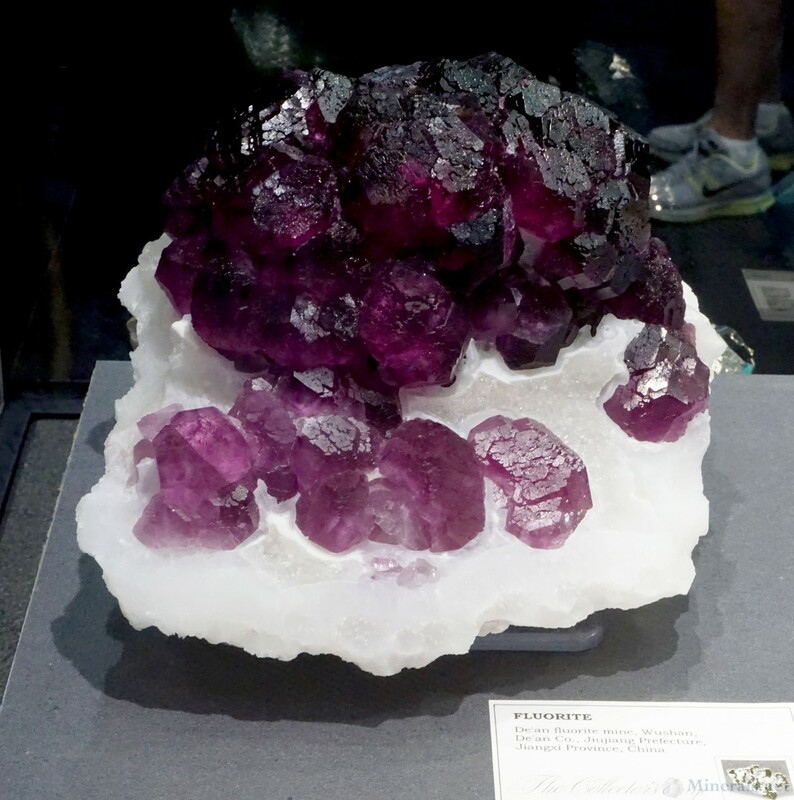 The city of Tucson, Arizona, hosts the largest and most significant agglomeration of mineral and gemstone shows every year at the end of January and early February. 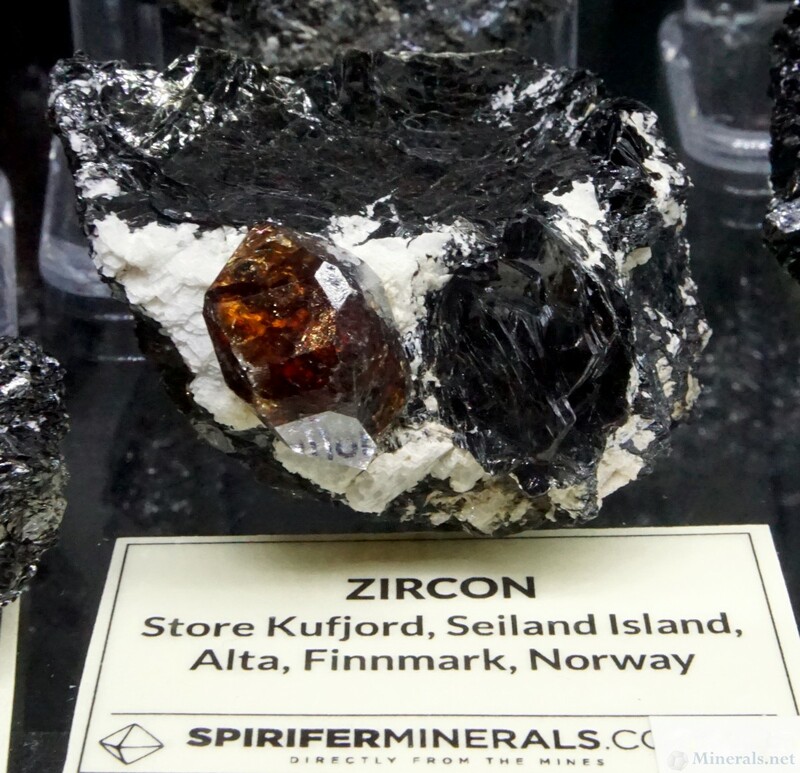 This year, our reports have been more detailed than ever before. 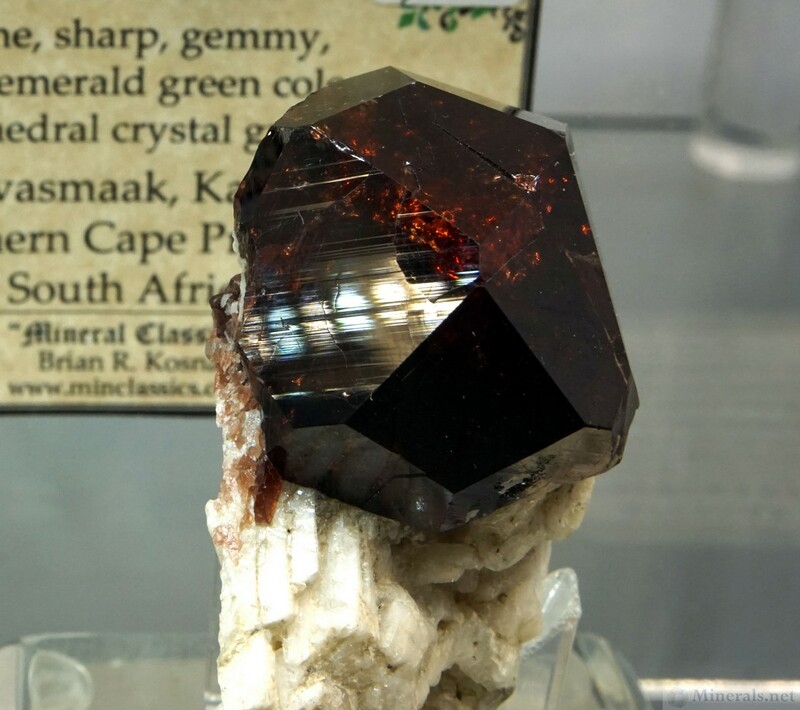 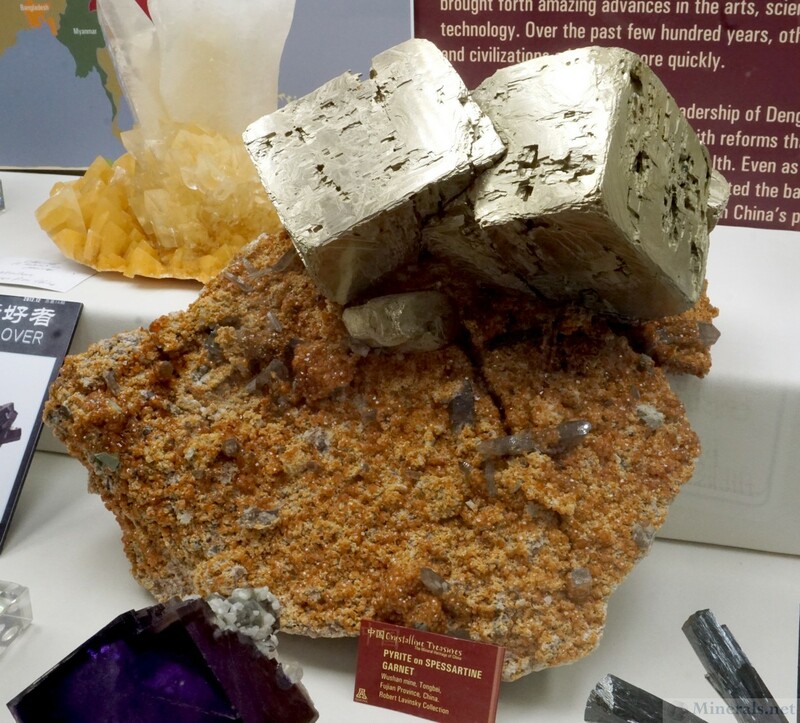 This post, our final in the series of the 2018 Tucson Gem and Mineral Show®, is a tour at the booth of Collectors Edge, a prominent mineral dealer from Colorado. Collector's Edge traditionally has the largest and most audacious booth on the show floor, with several outstanding specimens in the hundreds of thousands of dollars category. Some of these photogenic centerpieces are pictured in this report. 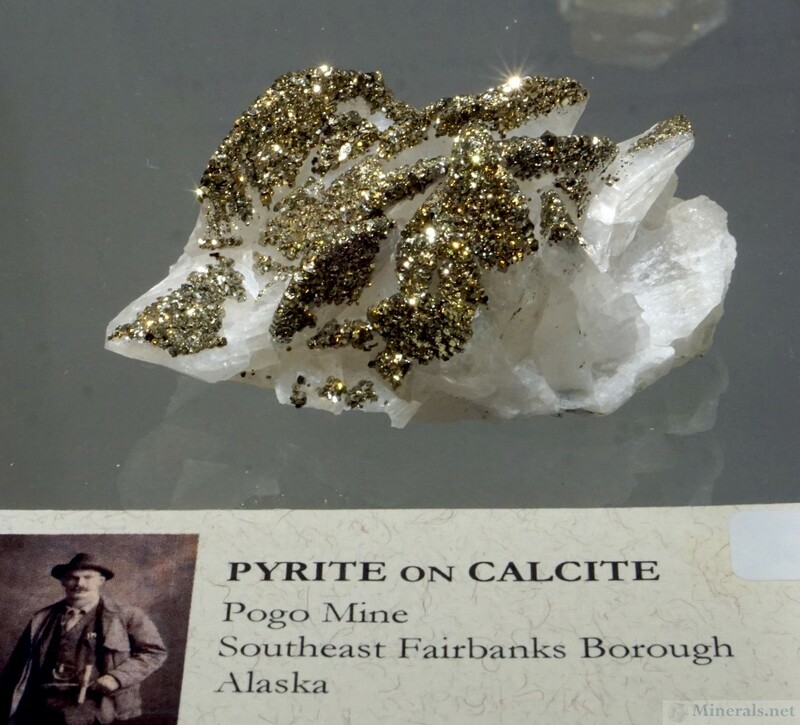 Collector's Edge also conducts specimen mining, and has gone into old localities and invested in mining them once again for specimens. 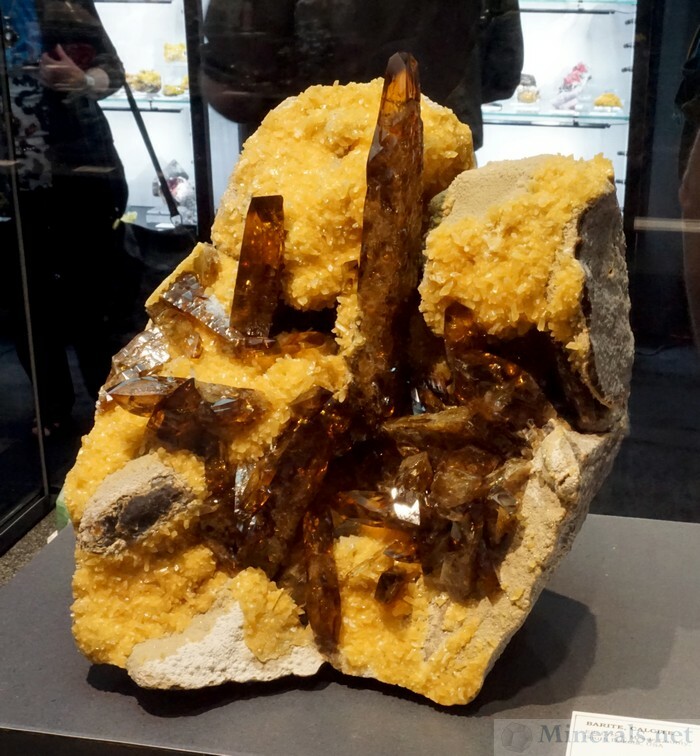 The most notable new find at their sprawling booth this year was golden brown Barite on orange Calcite from the Elk Creek Mine, Meade Co., South Dakota. The quality Barite from this locality are classics among collectors, and it was quite refreshing to see new material. 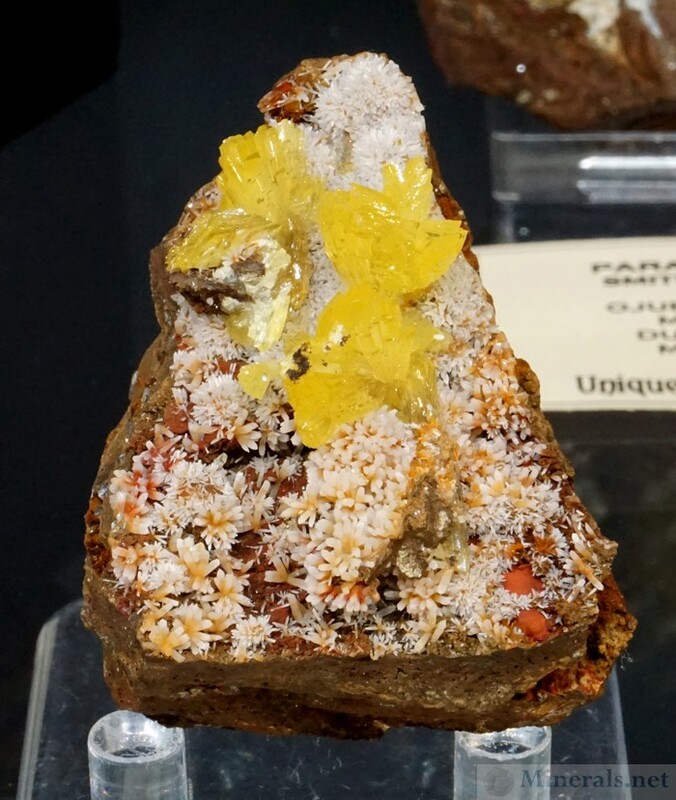 Another exciting entry from Collector's Edge was a suite of exceptional Pyromorphite from the Bunker Hill Mine, Kellogg, Coeure d'Alene District, Shoshone Co., Idaho. 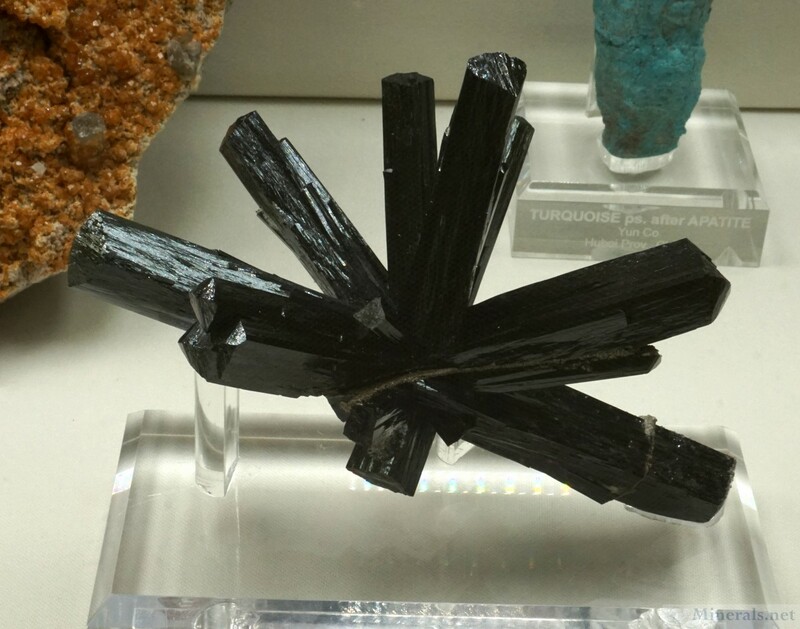 Pyromporphite from this mine is considered among the world's best, but mine production has ceased and specimens have not come from this mine in quite some time. 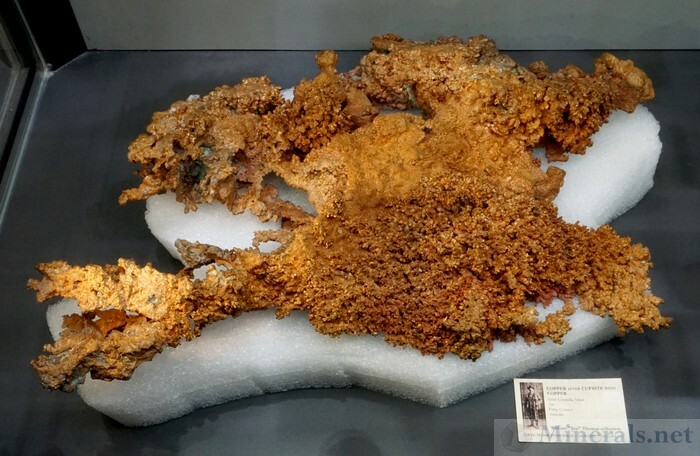 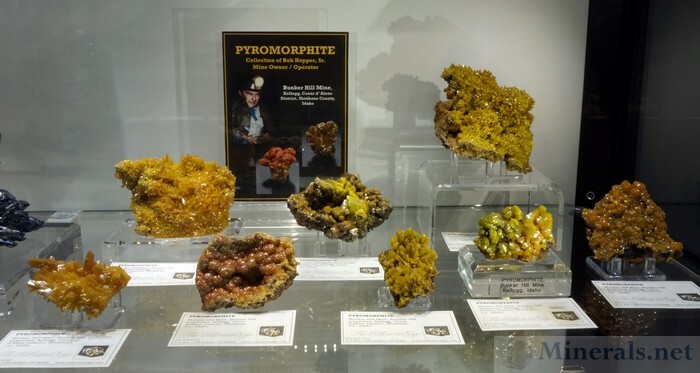 Collector's Edge had recently acquired the personal collection of Bob Hopper, Sr., the mine owner and operator, with many exceptional Pyromporphite specimens from the mine. One more noteworthy comment from Collector's Edge. 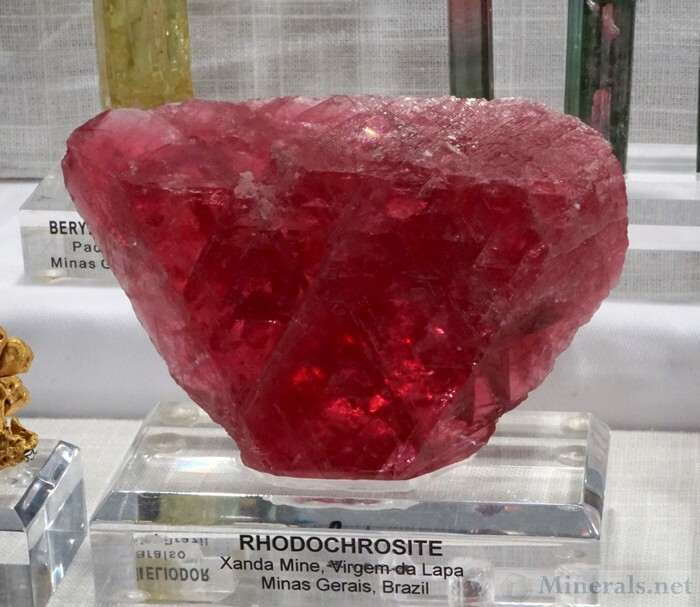 Their staff had mentioned that they have started a new mining operation for Rhodochrosite, directly up the hill from the famous Sweet Home Mine in Colorado. 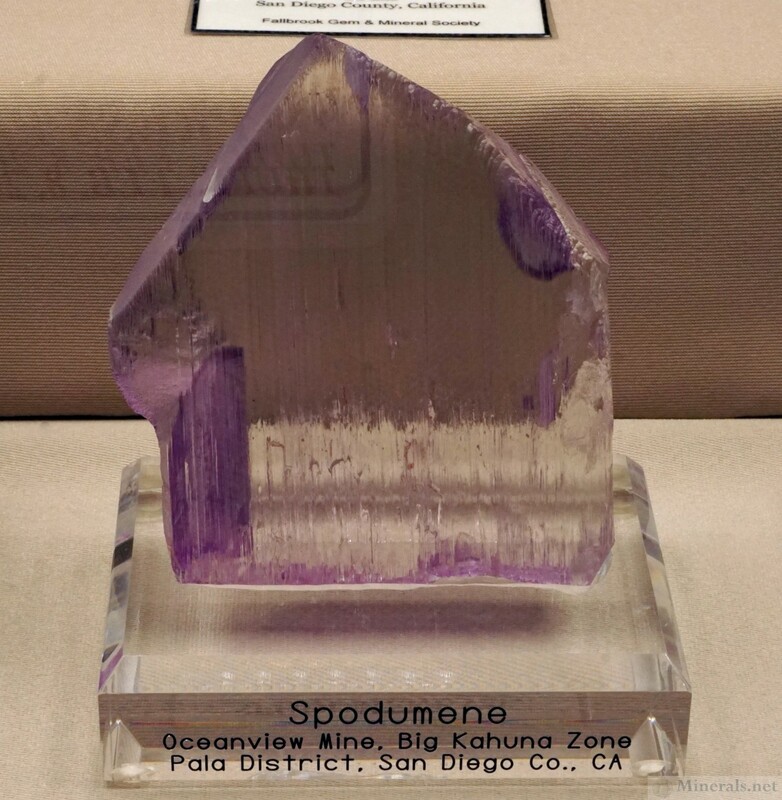 The hope is that they will find new specimens exploiting the same vein as the Sweet Home Mine. 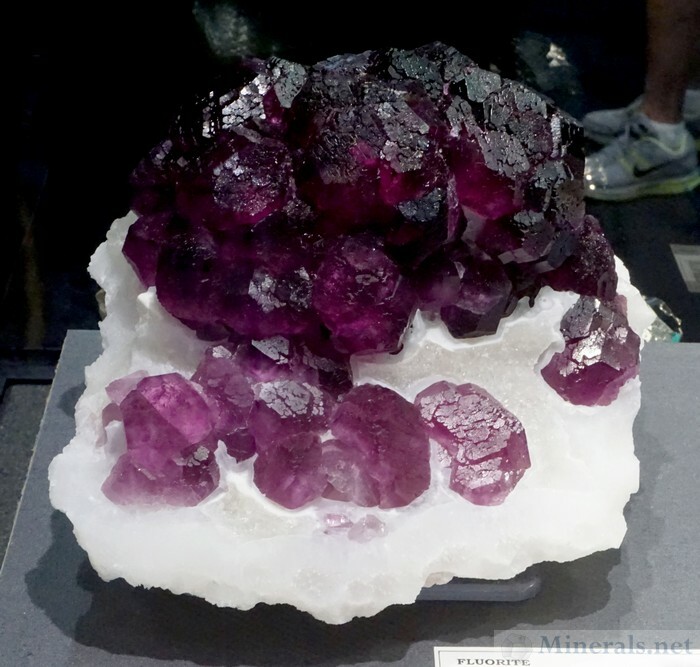 This operation would be solely for specimens, and would be a new mine tunnel not connected to the Sweet Home Mine, although it would be adjacent to it. The new mine has been named the Detroit City Mine. We hope this operation will be productive and look forward to seeing, once again, a fresh supply of one of the most incredible minerals in the mineral kingdom. 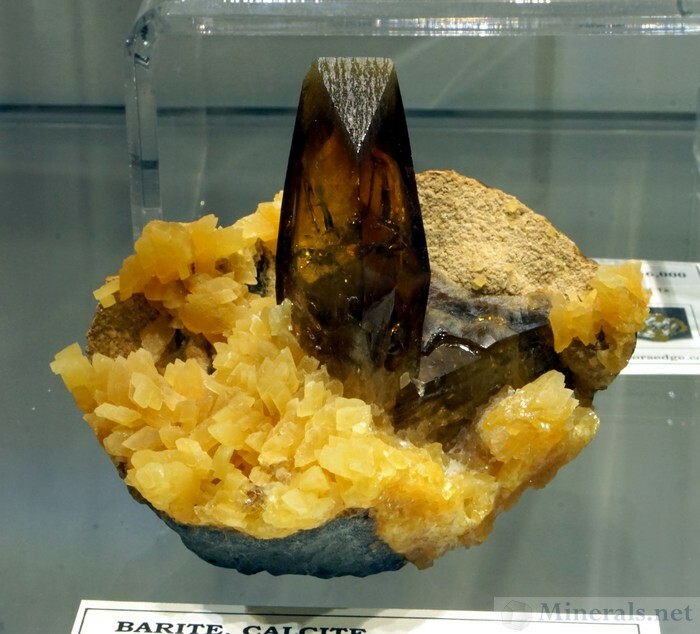 Large Barite Crystal on Calcite from Elk Creek, South Dakota. 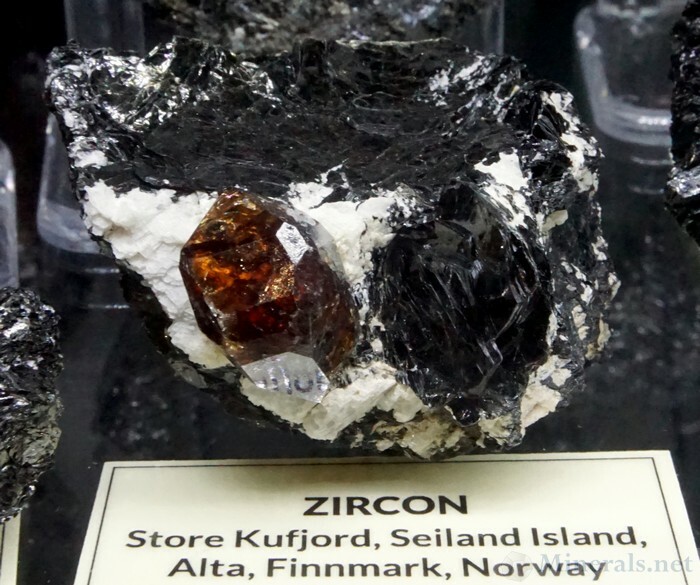 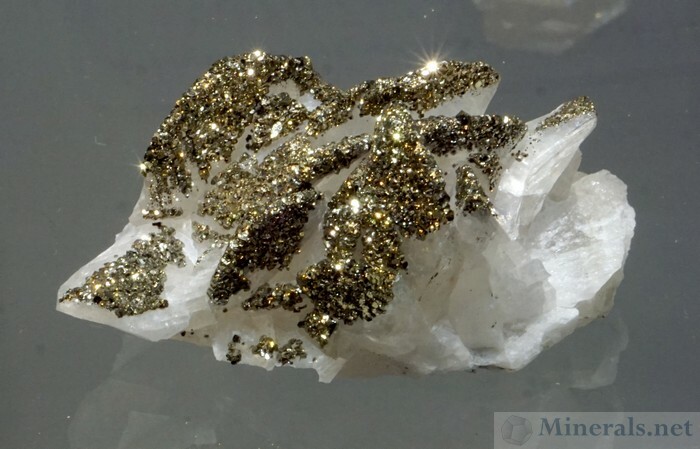 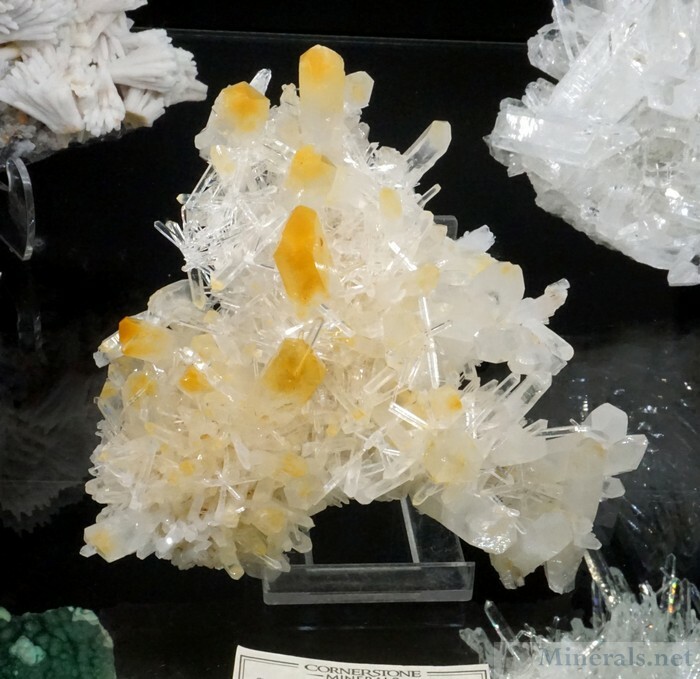 This post is a continuation of the dealer minerals at the 2018 Tucson Gem and Mineral Show®. 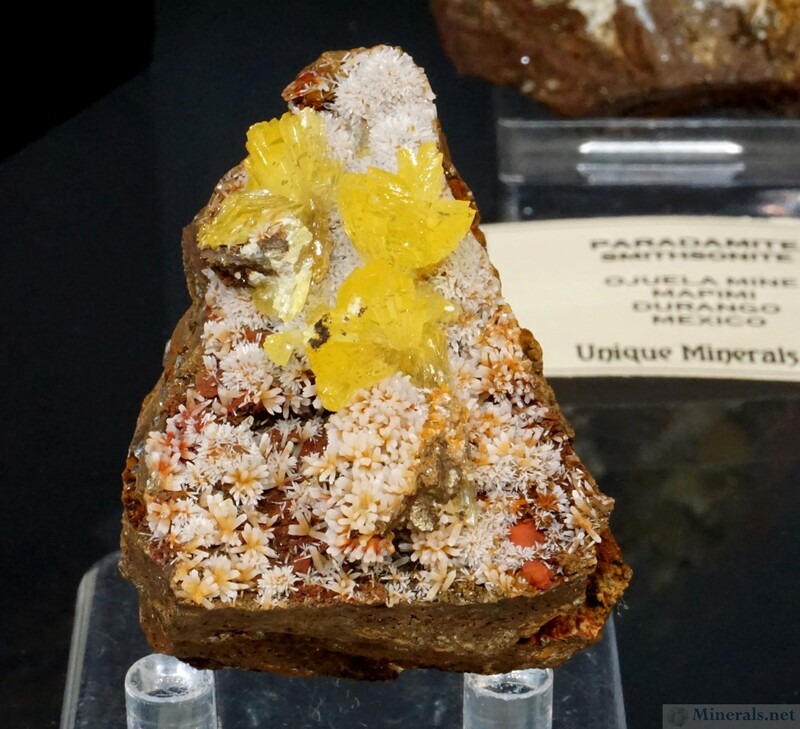 I couldn't fit all the pictures and content into a single post, so this is the second of my posts of some of the new finds or remarkable minerals presented by the dealers at the show. 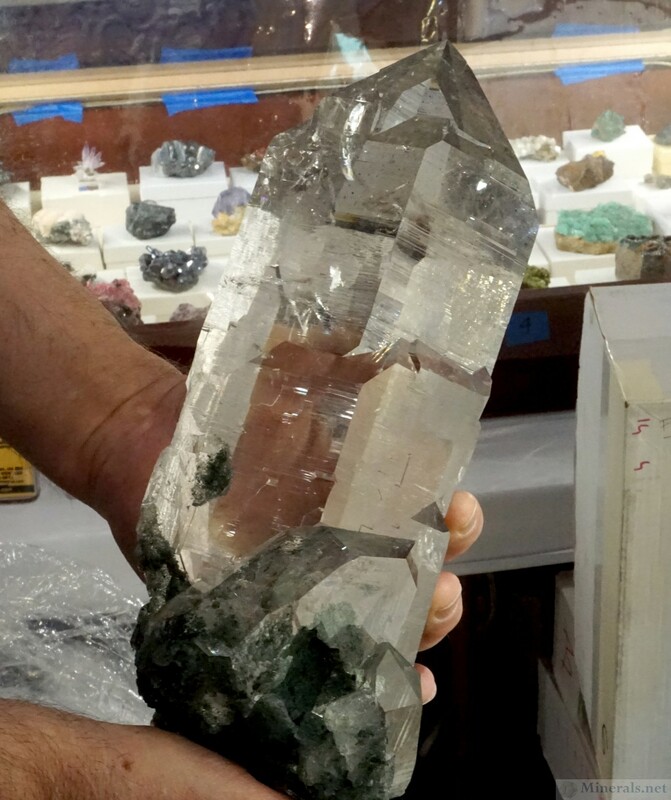 Moving along the show floor, I encountered the booth of Luis Burillos Minerals, where I was shown a new find of large crystal plates of brownish-green Clinozoisite from Cerro San Cristobal, Yauli Province, Peru. 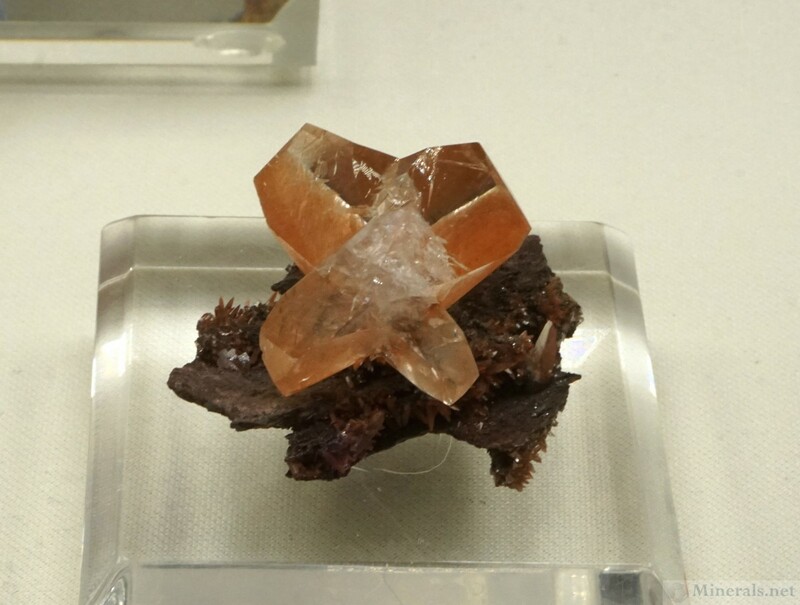 These crystals were pretty nice for a usually unremarkable mineral. 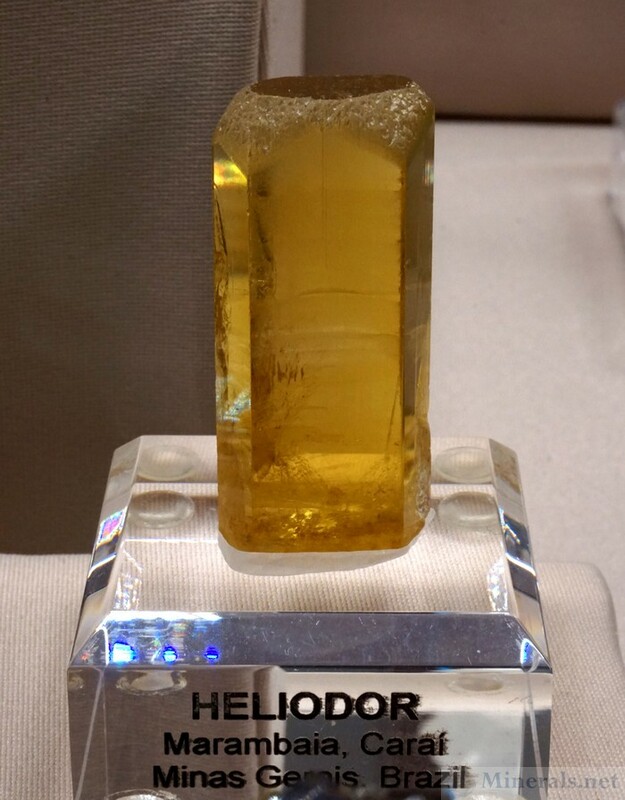 They were from the same deposit as those from Jaroslov Hyrsl that I saw at the InnSuites show. 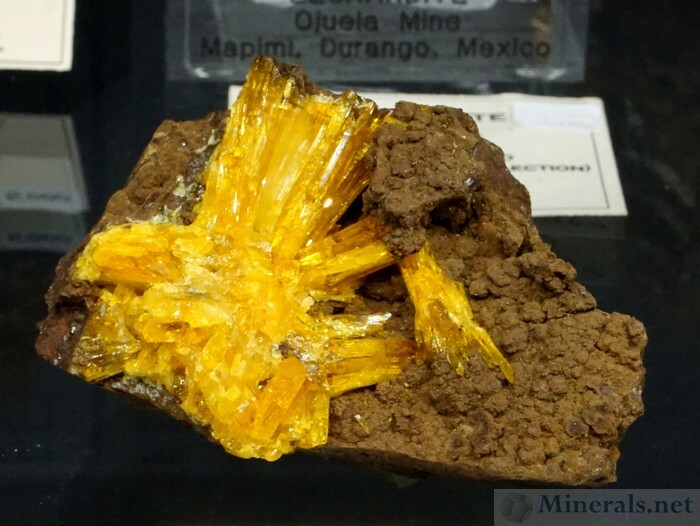 Unique Minerals had several fascinating finds from the ever productive Ojuela Mine in Mapimi, Durange, Mexico. 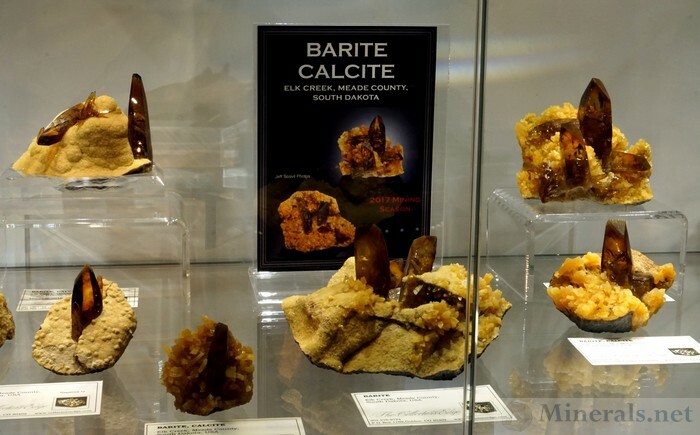 This classic locality, considered to be among the most famous and significant mineral specimen deposits in the world, just doesn't stop giving. 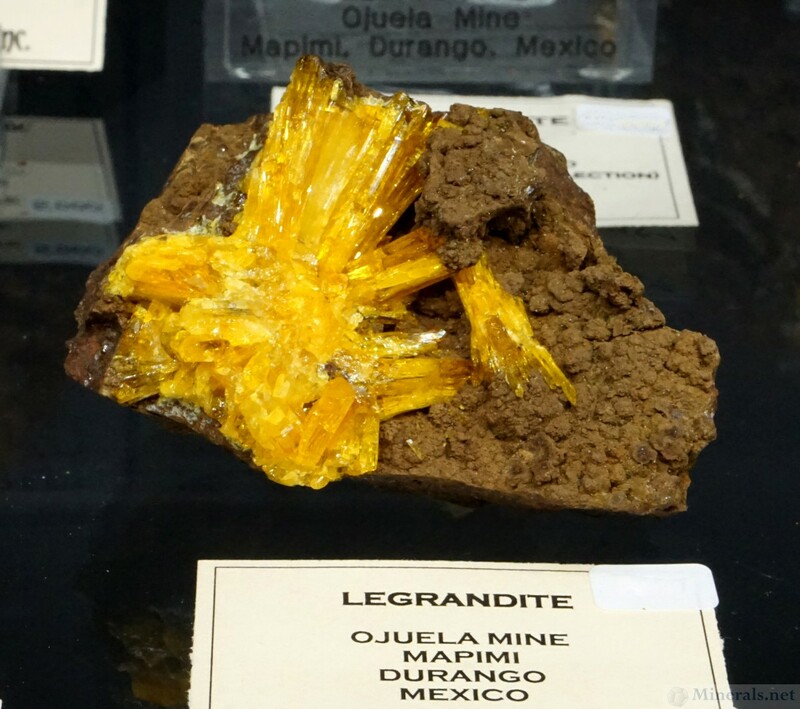 Unique Minerals sported an entire shelf of newly mined (2017) brightly colored, Ojuela minerals, with the most eye-catching being bright yellow Legrandite in radiating fans, similar to the classic, highly desirable material from past decades. 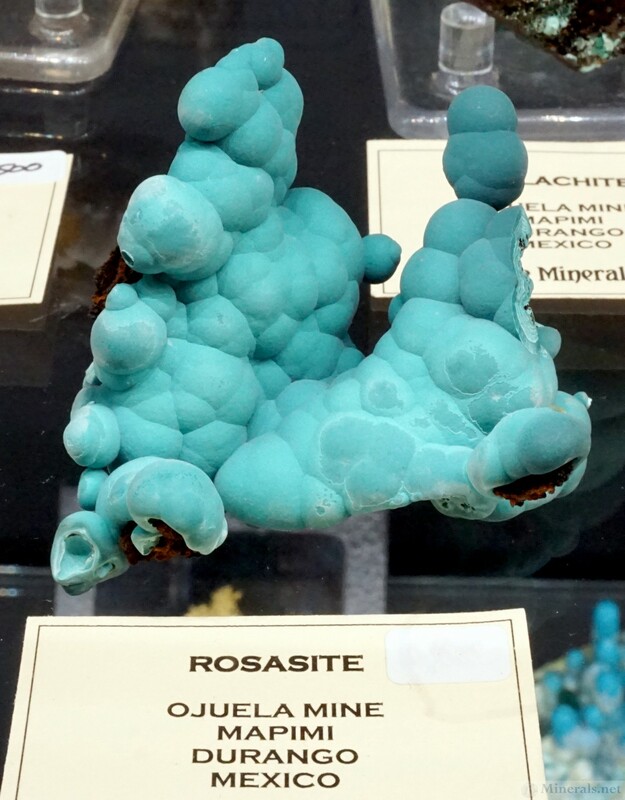 Other interesting Ojuela minerals included Paradamite (a rare Adamite dimorph) in highly desirable lustrous yellow crystal clusters, dark bluish-green globular Rosasite, and banded reniform Malachite. Well-Arranged Molecules had their usual suite of minerals from the extinct Jeffrey Quarry locality in Asbestos, including some outstanding Vesuvianite, an unusual colorless Grossular, and many fine Grossular var. 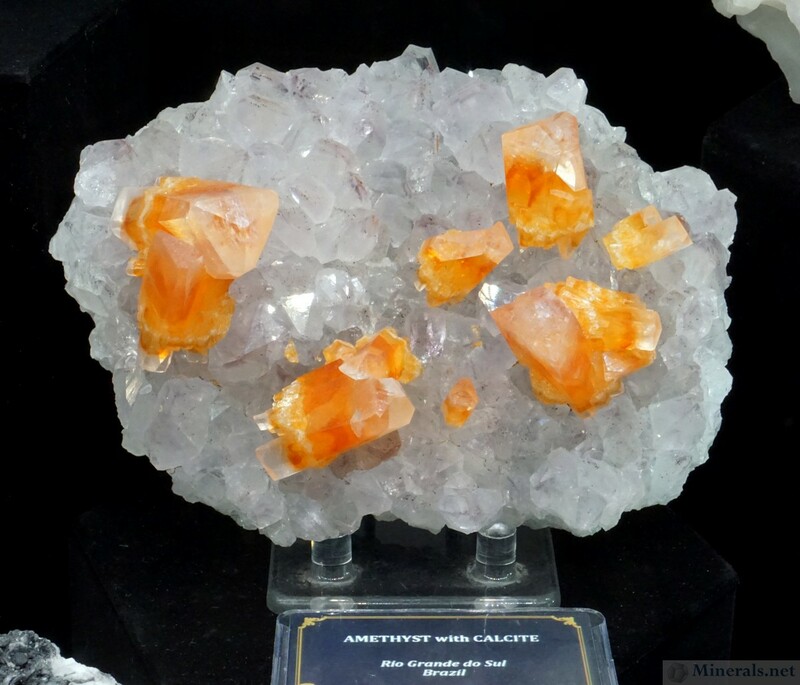 Hessonite crystal clusters. 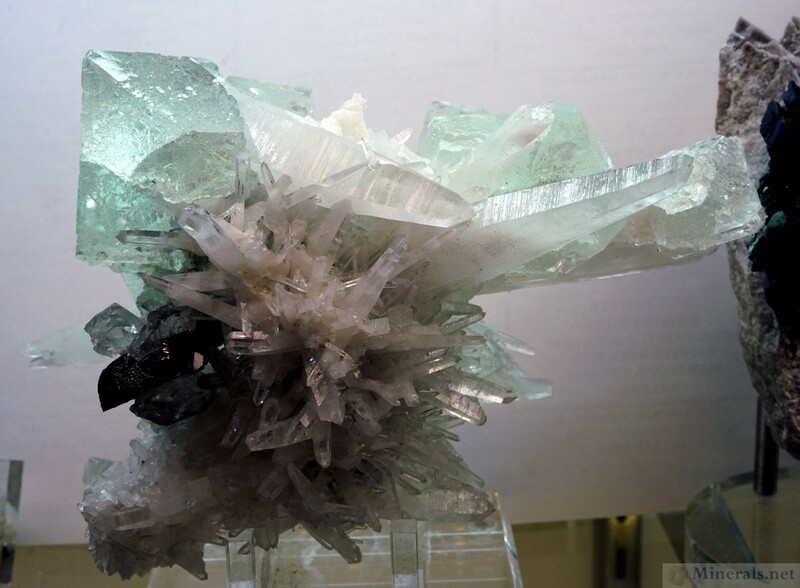 Well-Arranged Molecules also showed me something quite outstanding: Remarkably large, colorless Quartz crystals with an alpine-type look and feel, from a new find in the Manihar Valley, Kullu District, Himachal Pradesh, India. 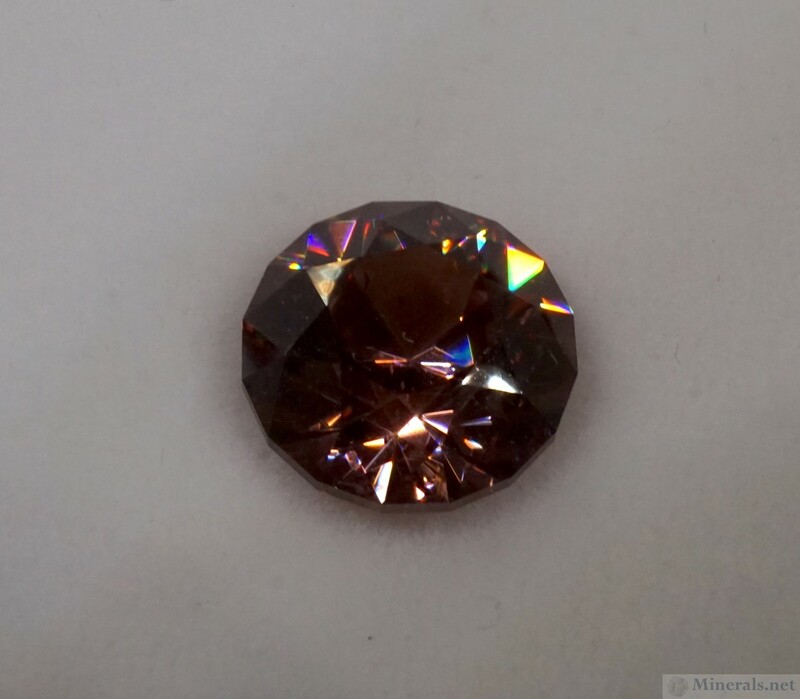 Heading down to the Kosnar brothers, who share an adjacent booth, I noticed Brett Kosnar of Kosnar Gem Co. had some interesting cut gem finds, the most fascinated being a champagne-colored Zircon from a new deposit in Tanzania. This material is highly lustrous, has great fire, and exhibits excellent color and transparency. 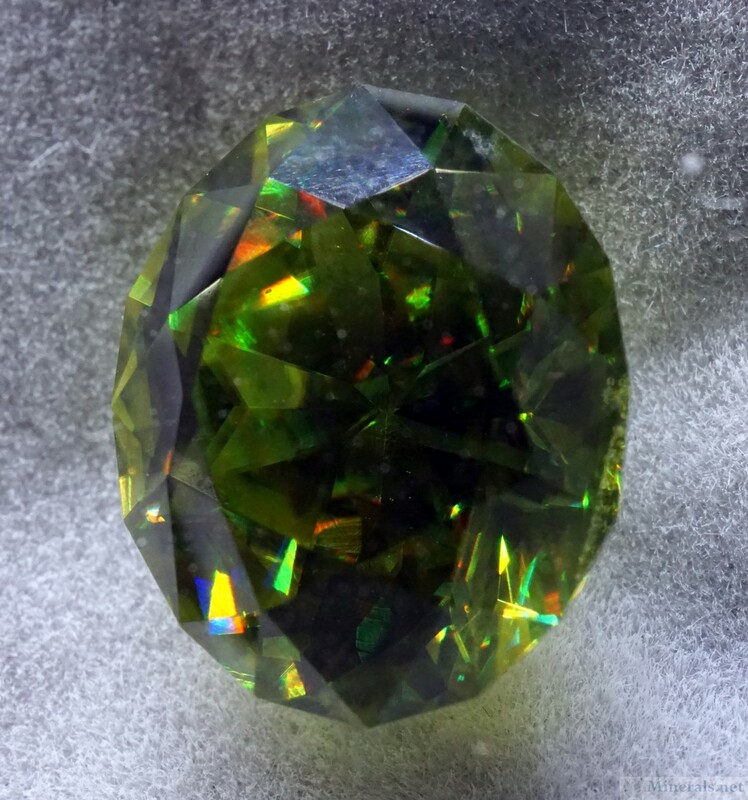 Kosnar Gem Co. also had a bright green, gemmy Titanite that sparkled with a remarkable brilliance and dispersion. 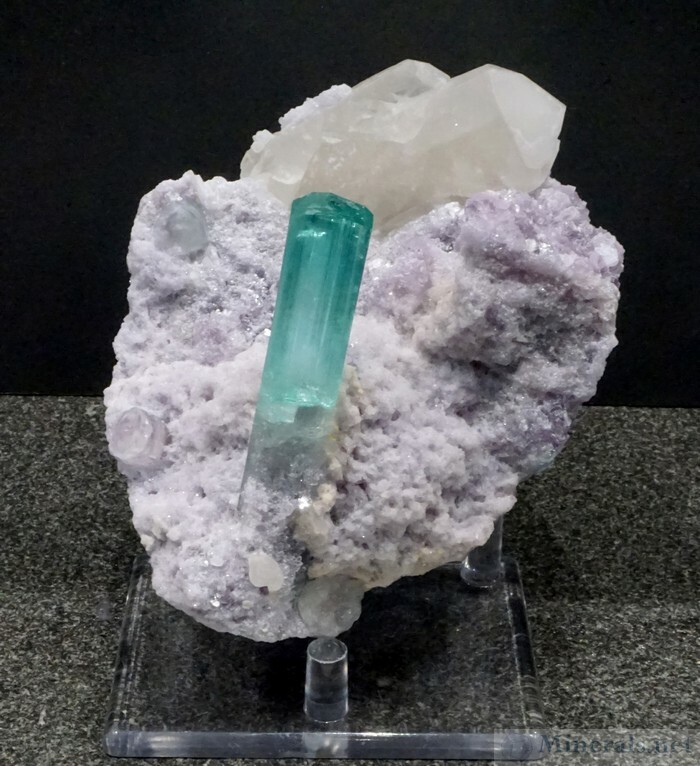 Bruce Wood Minerals had a delicate but highly desirable combination of mint-green Fluorite with Huebnerite on Quartz from Mundo Nuevo, Peru. 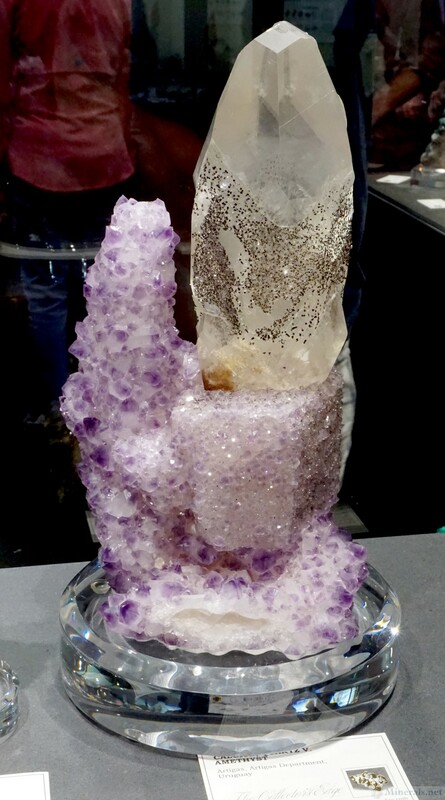 The association, crystal formation, and lack of damage on this piece was remarkable. 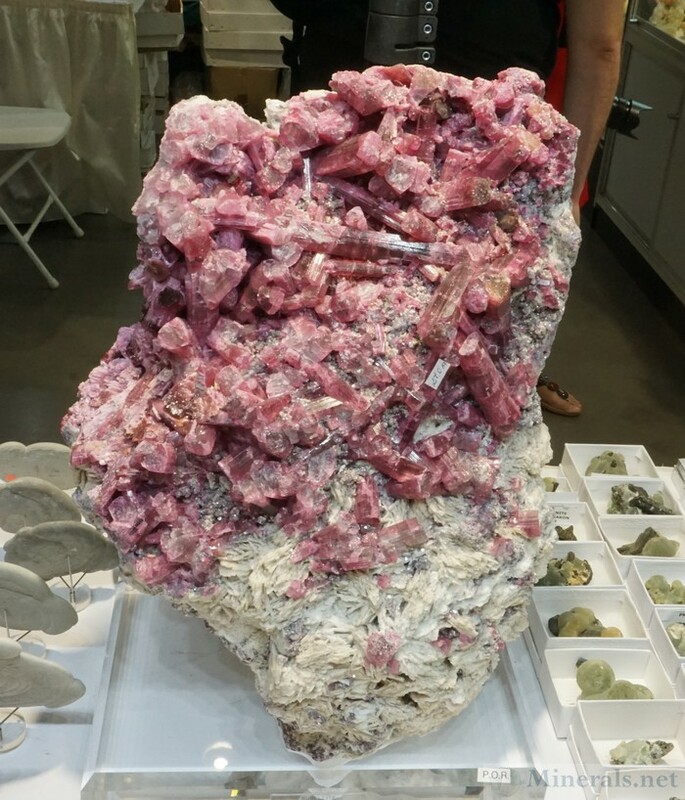 Near the entrance to the booth, Bruce Wood also had a giant red Elbaite ("Rubellite") Tourmaline crystal cluster from the Cruzero Mine, Minas Gerais, Brazil. This was quite a conversation piece, and no doubt brought some show spectators into Bruce Wood's booth. The Tucson Gem and Mineral Show® is the most important event of all the mineral and gem shows that take place in Tucson each February. 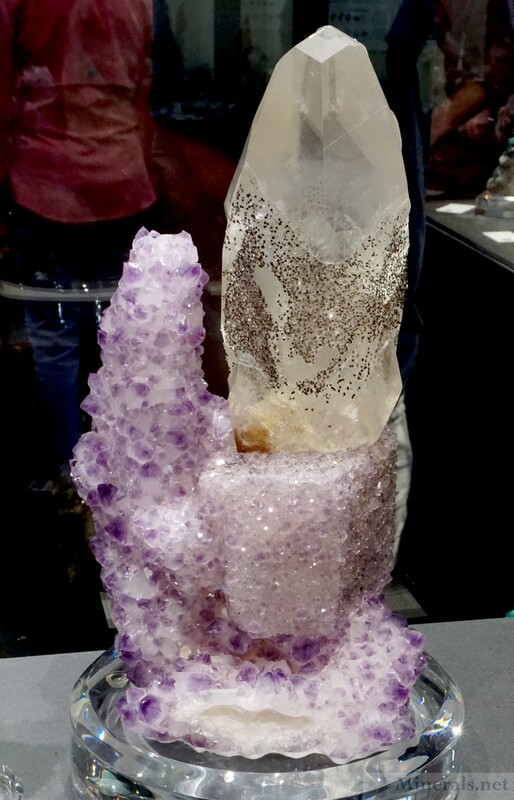 Aside from the outstanding display exhibits, the dealers that fill up the show floor with their mineral and gemstone wares are the real driving force of the show. 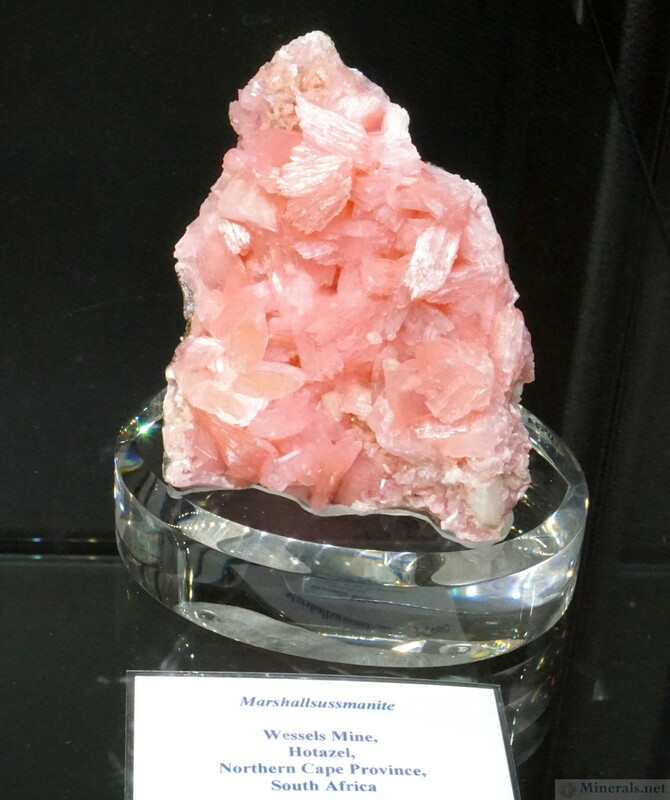 Almost all the prestigious mineral dealers have a booth, and for many this the place where they introduce new finds. As in previous years, I scouted the show floor looking for new and interesting material to photograph for this show report. 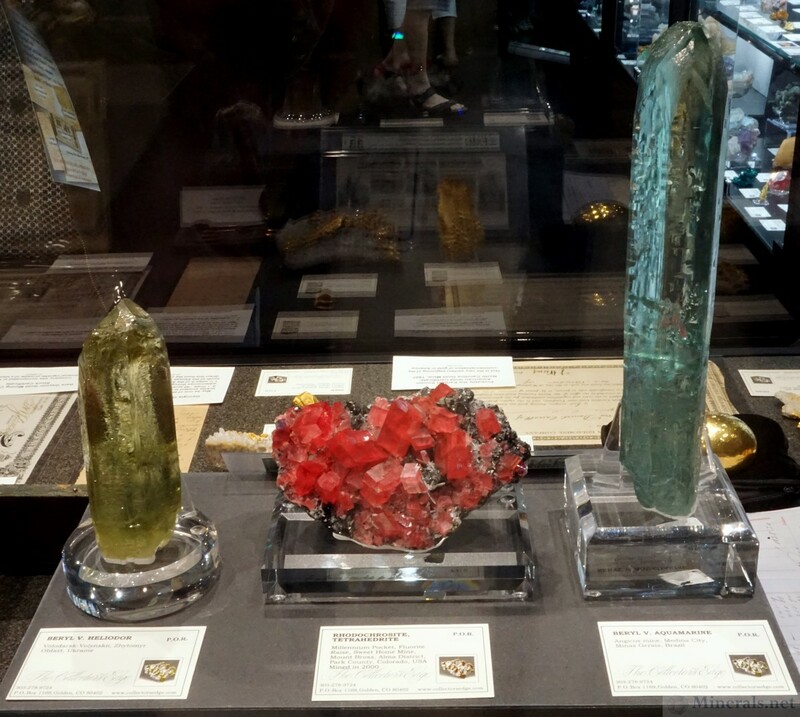 There was plenty to be found, and these are shared in this and the next two posts, accompanied by pictures. 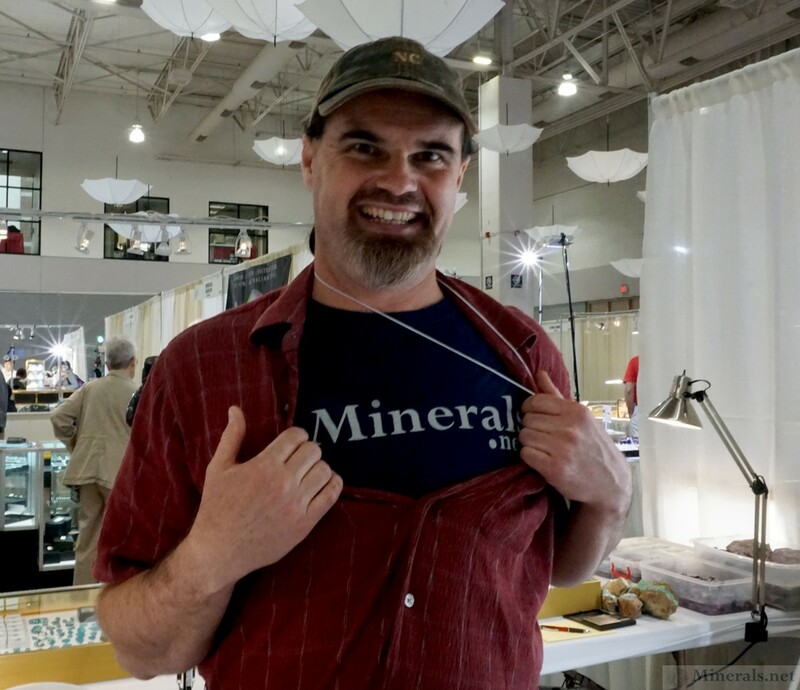 I started my dealer circuit with Cornerstone Minerals, in the far left corner of the show floor. They had some brand new finds of clear Quartz crystals included with bright yellow amphibole, from Boyaca, Colombia, which at the time of the show had not been fully analyzed with an exact mineral identity other than being an amphibole species. 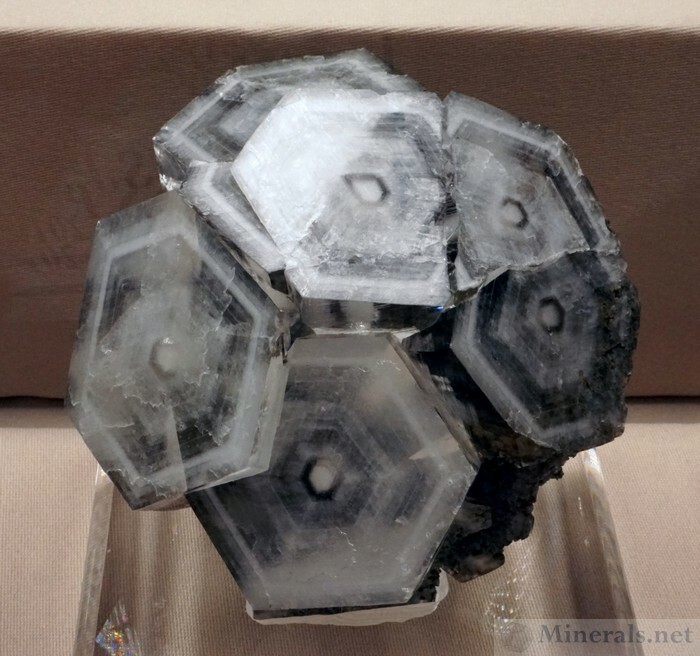 These specimens were highly aesthetic and unlike any other types of Quartz with inclusions seen previously. 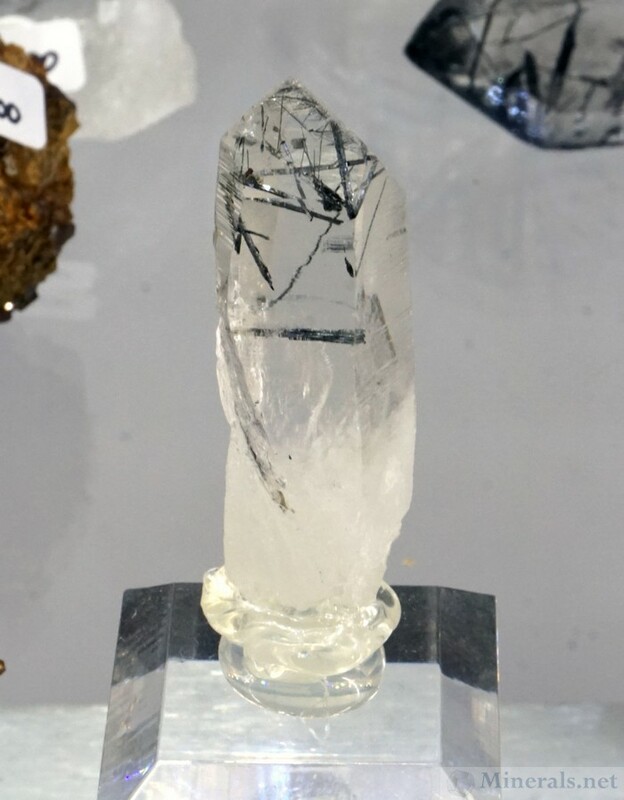 On the topic of Quartz inclusions, Rusty James of Throwin' Stones had some really interesting Stibnite inclusions frozen in clear Quartz from Ganesh Himal in the Himalayan Mountains in Nepal. They looked very much like Tourmalinated Quartz, but with metallic-lustered Stibnite instead of Tourmaline. Joe Dorris of Pinnacle 5 Minerals had a huge cluster of Microcline var. 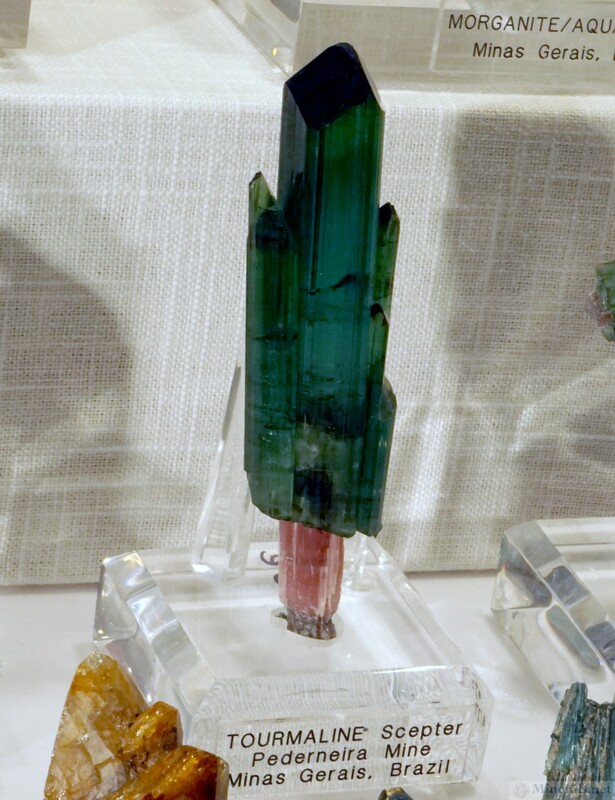 Amazonite in Smoky Quartz, from the Smoky Hawk Claim in Florissant, Colorado, which took up an entire shelf in his display case. The plaque next to this gargantuan cluster stated that this is the first showing of the second largest specimen from the Icon Pocket. 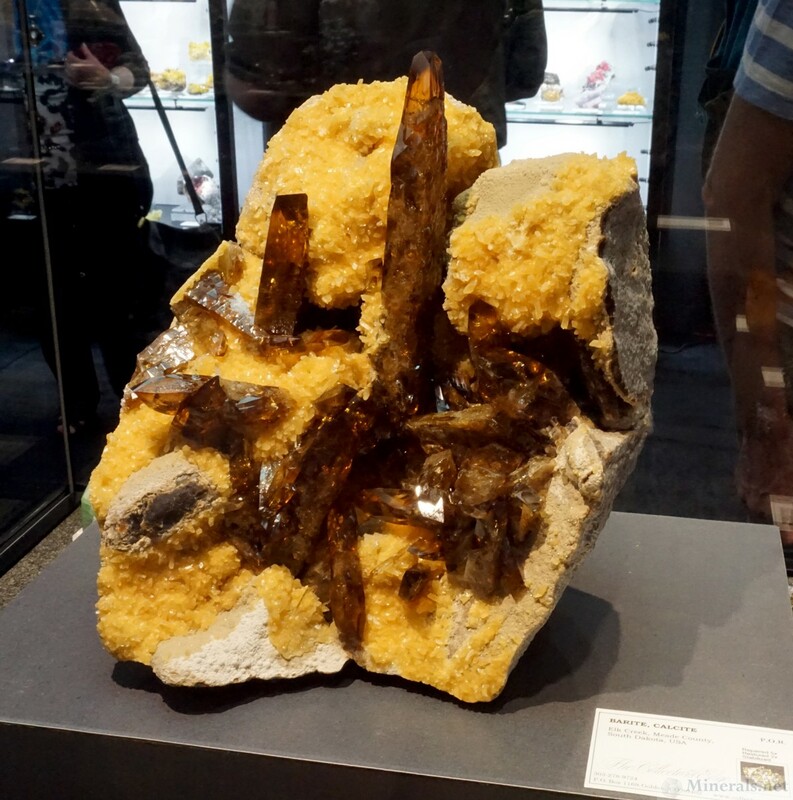 This hunk of crystals was discovered in 2012 and filmed in the Prospector's TV series, and the repair project of joining all the broken crystals from the pocket was completed in 2018. 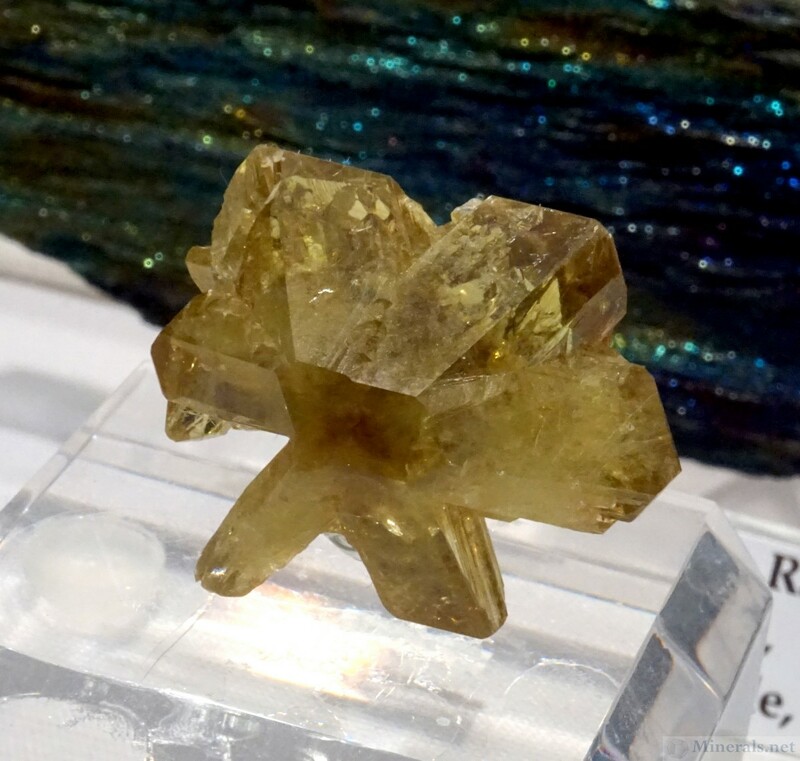 The relatively new find of yellow Brucite from Khuzadar District in Baluchistan, Pakistan, has been flooding the market, and many dealers at the show featured this flashy material. 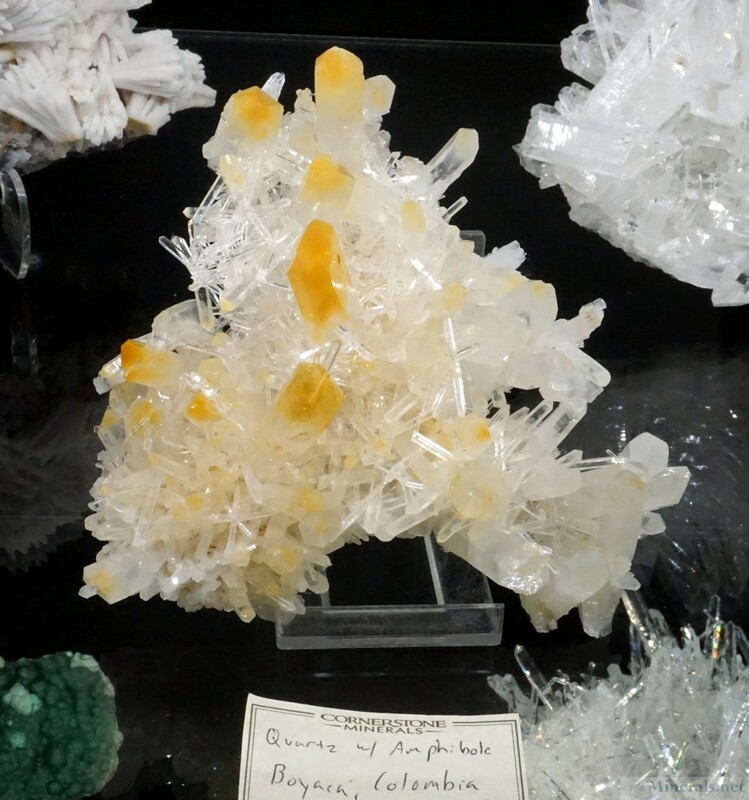 However, Fine Art Minerals stood out with some of the largest and brightest Brucite specimens from this new find. 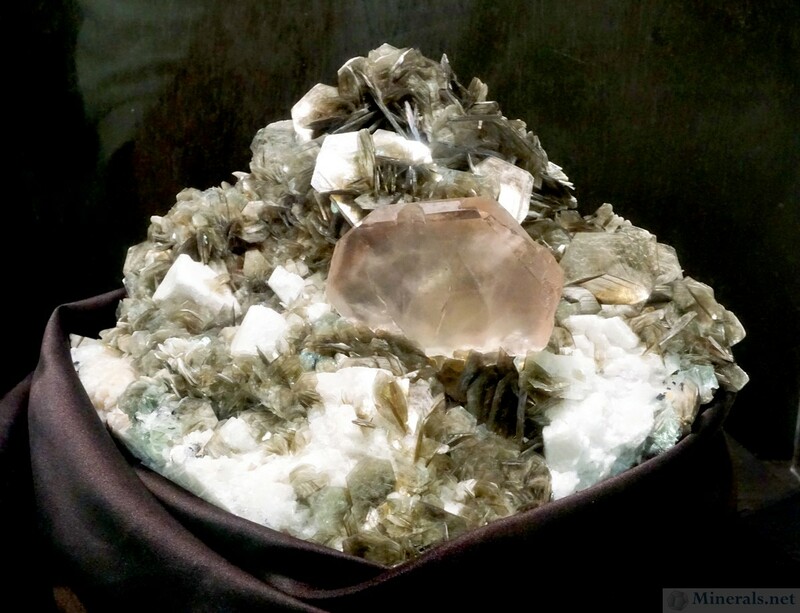 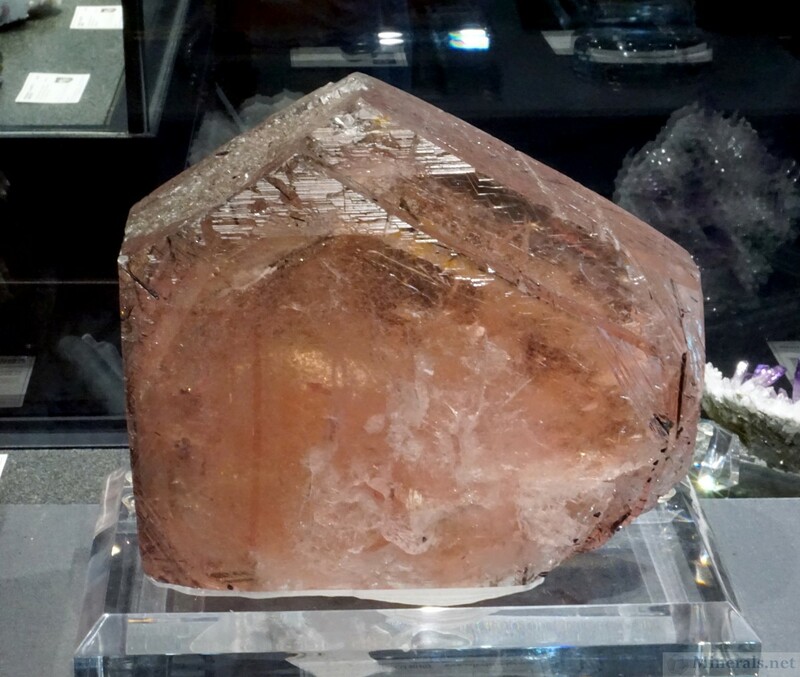 Fine Art Minerals also featured a giant white Hambergite crystal, the biggest by far that I have ever seen. 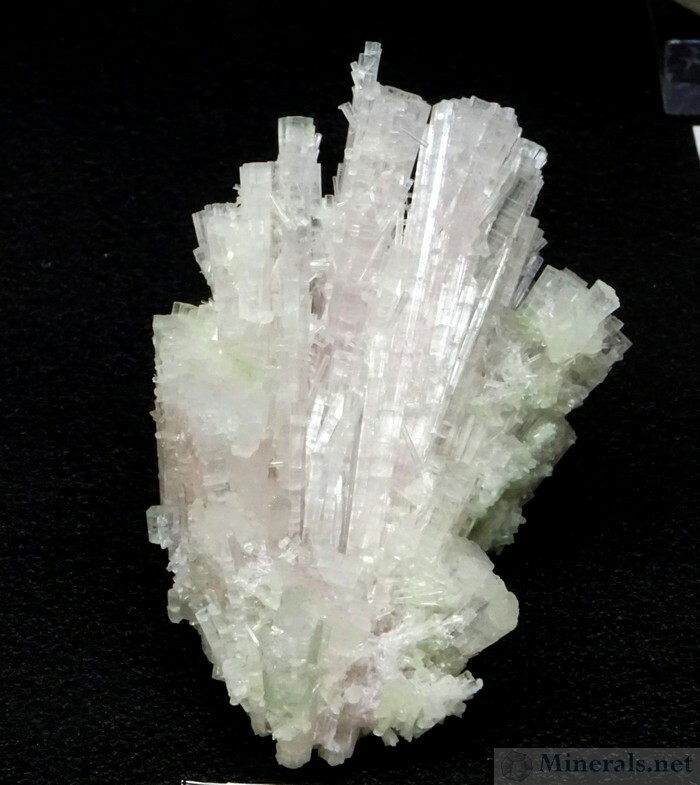 It was elongated with parallel fibers, resembling the large Gypsum Var. Selenite wands from Morocco. 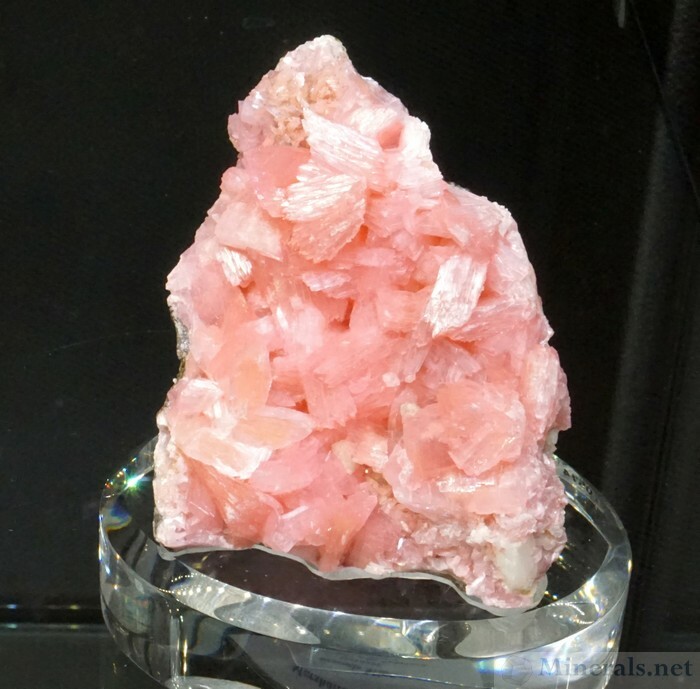 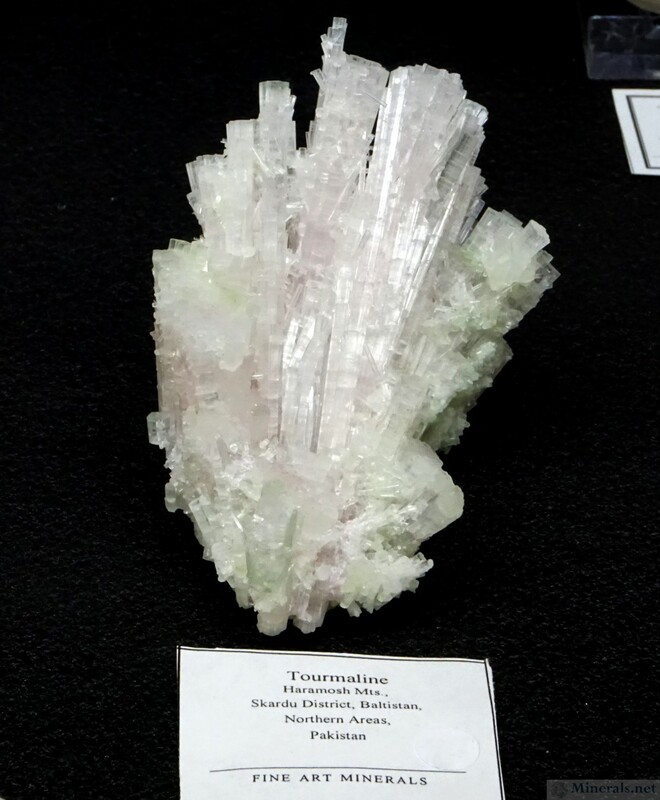 There was one additional surprise from Fine Art Minerals: Interconnected Elbaite Tourmaline crystals with a very faint pink color from the Skardu District in Pakistan. 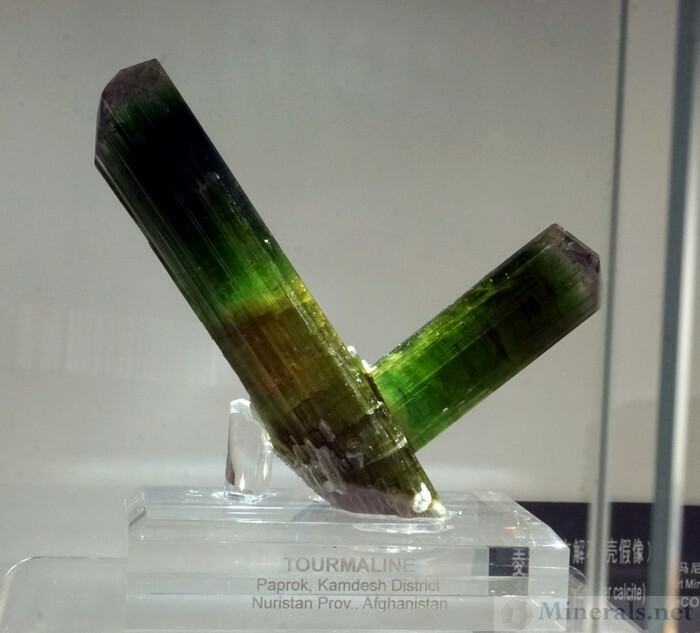 These Tourmalines are very soft-toned and delicate looking, but at the same time highly aesthetic. 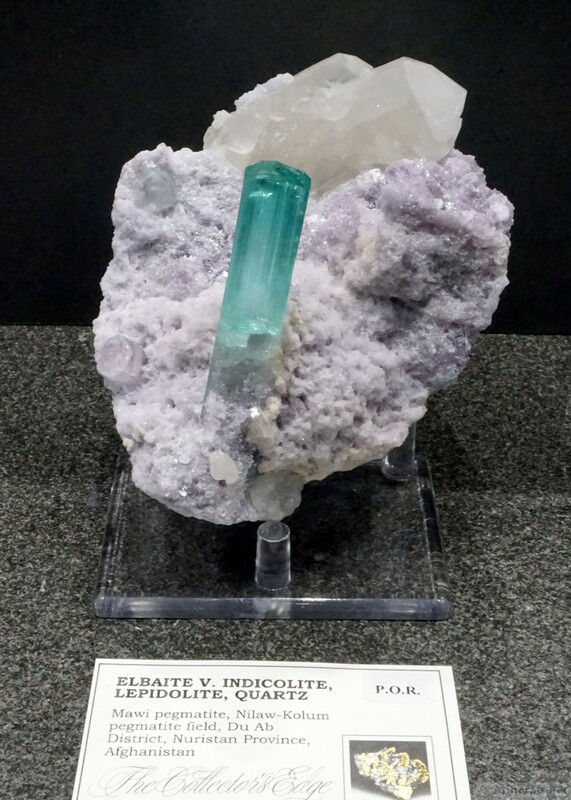 Over to Crystal Classics, from their native United Kingdom were some new Fluorites from Weardale, from both the Rogerley Mine and the Diana Maria Mine. 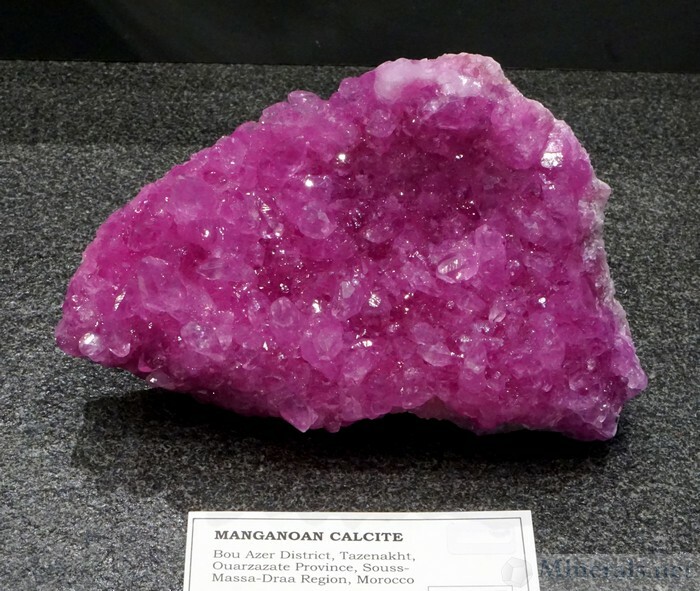 Both these mines are part of the older Rogerly Quarry, a defunct 19th-century limestone mine. 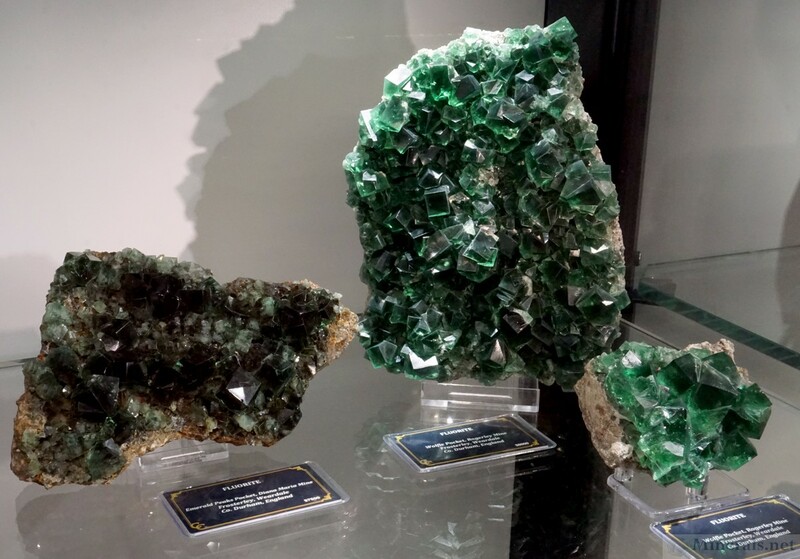 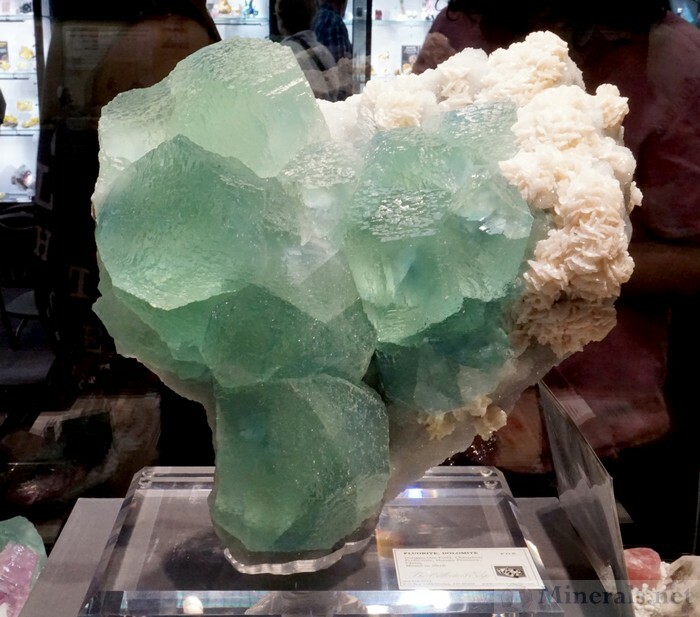 The Rogerley Mine has been commercially mined for Fluorite specimens since the 1990's, producing exceptional green Fluorite cubes that turn blue in sunlight from natural fluorescence. 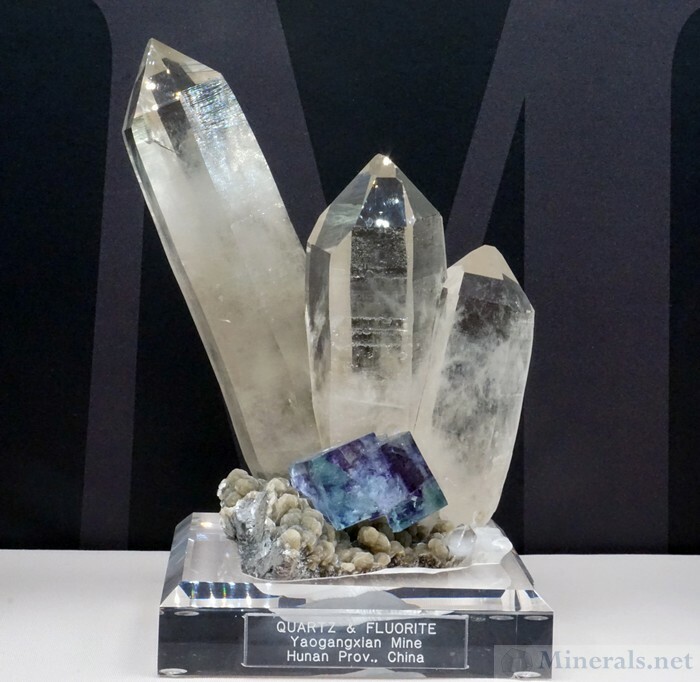 Ian Bruce, owner at Crystal Classics, took over specimen mining in 2017, and had lots of nice Fluorites from that locality at his Crystal Classics booth. 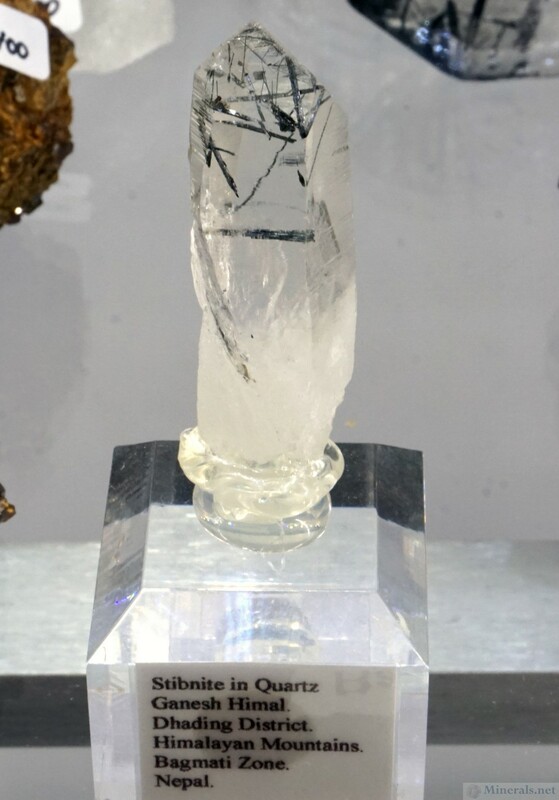 Many of the Rogerley Mine specimens were labelled as being from the Wolfie Pocket. 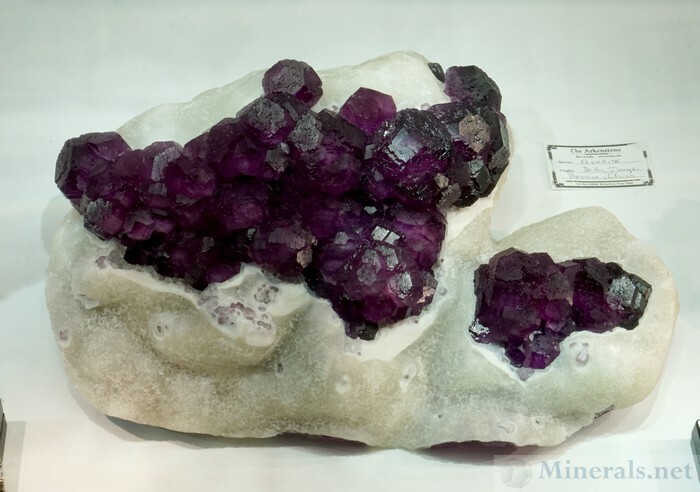 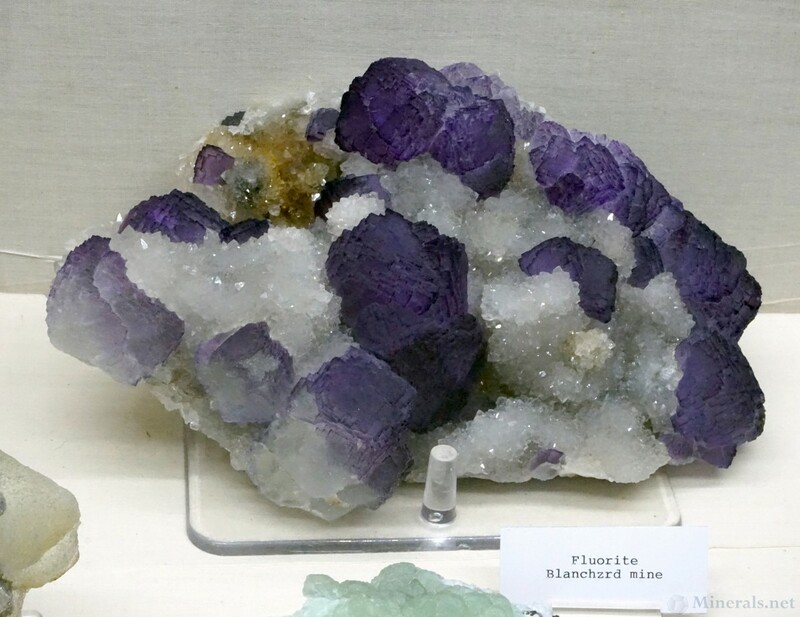 Nearby, in the western extension of the defunct Rogerley Quarry, another vein of Fluorite was further exploited for specimens by Crystal Classics, producing Fluorite similar to the Rogerly Mine material, but with a slightly darker color as well as some purple examples. Ian named this find in honor of his wife, calling it the Diana Maria Mine. 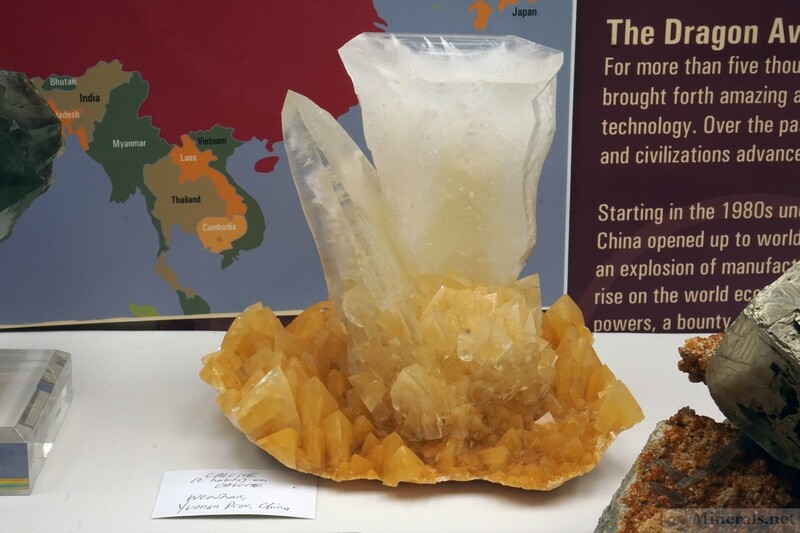 Crystal Classics featured some of the newly mined finds from the Diana Maria Mine at this show. 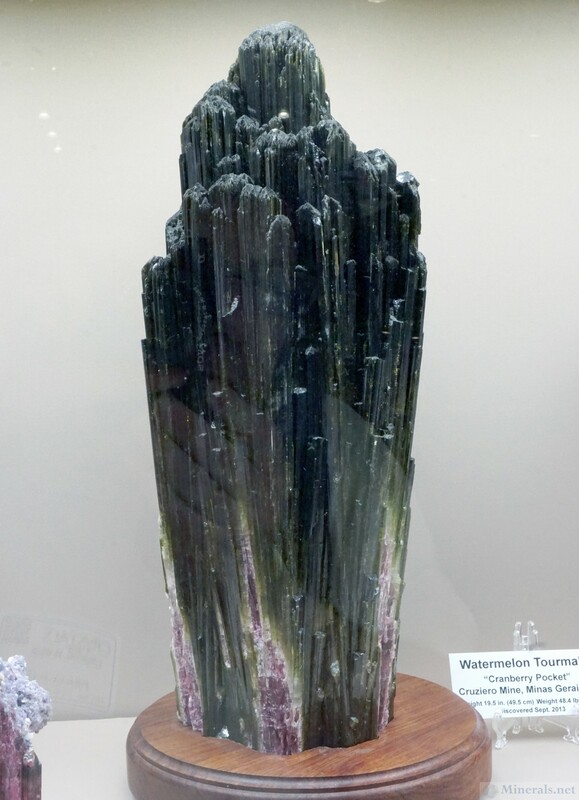 At the corner of Stonetrust's booth stood a huge, attention-grabbing Stibnite crystal cluster several feet tall. 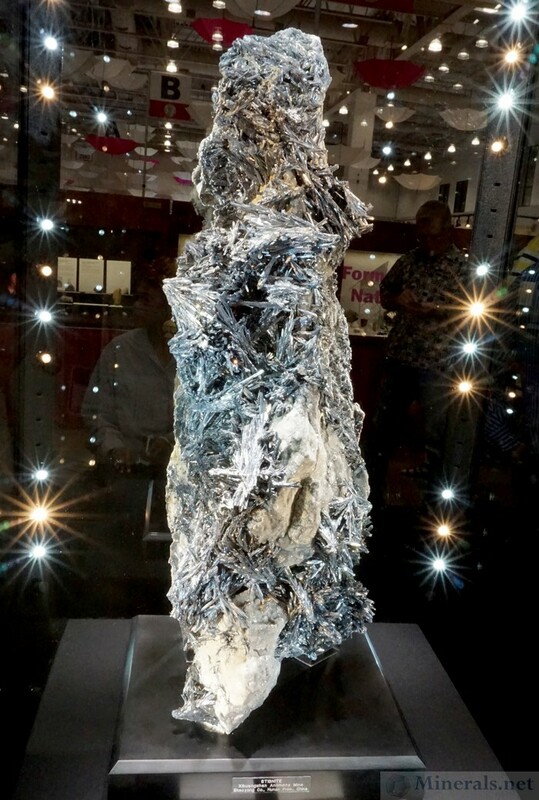 This iconic specimen was from the Xikuangshan Antimony Deposit in Shaoyang Co., Hunan Province, China, and was one of the most memorable minerals of the show. 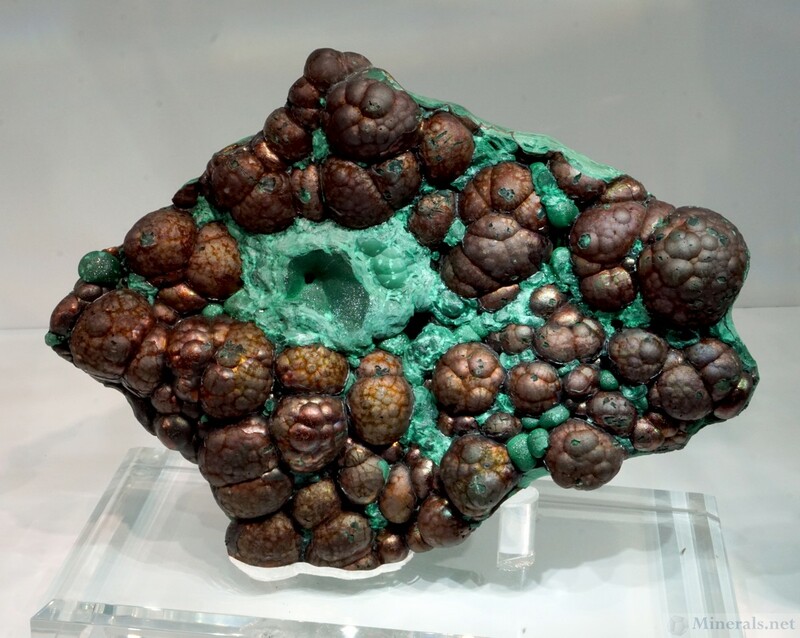 A new and interesting mineral combination at the Arkenstone booth was botryoidal bronze Goethite with Malachite. The unique bronze color of the Goethite, combined with the contrasting green of the Malachite, made for a remarkably aesthetic mineral. 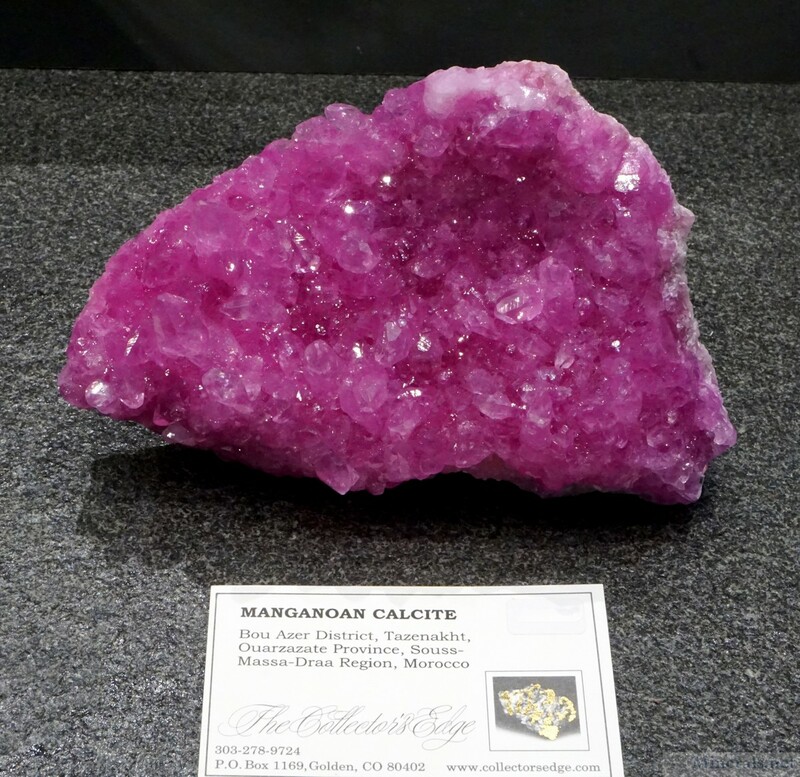 These specimens were from an unspecified location in Northern Laos. 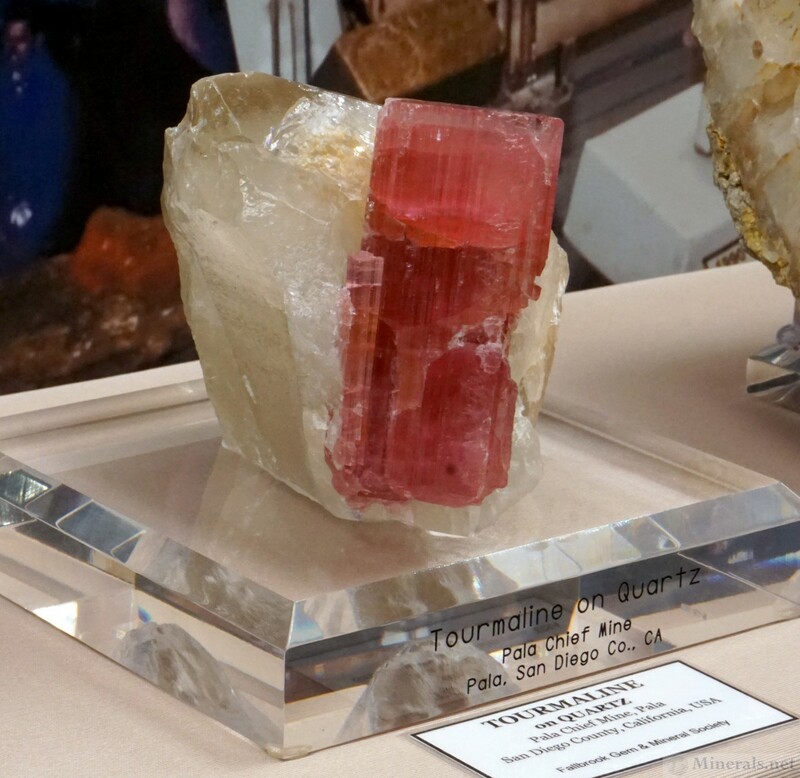 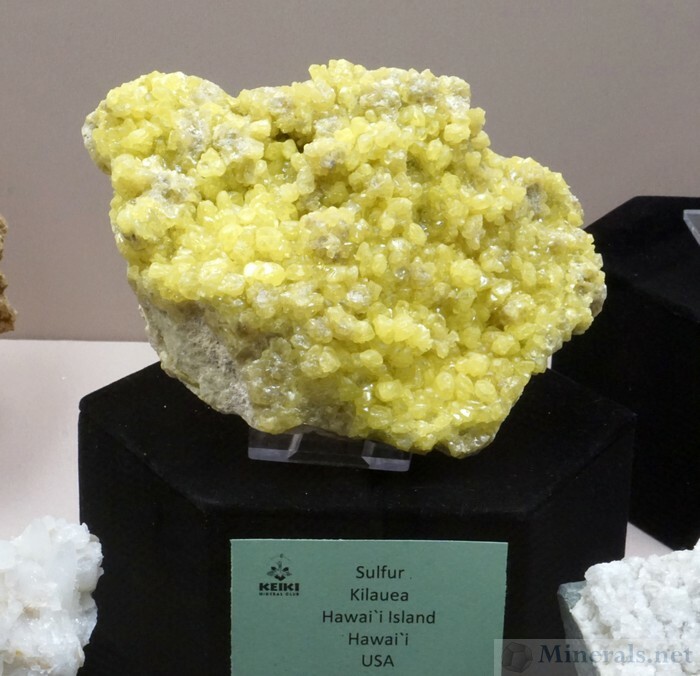 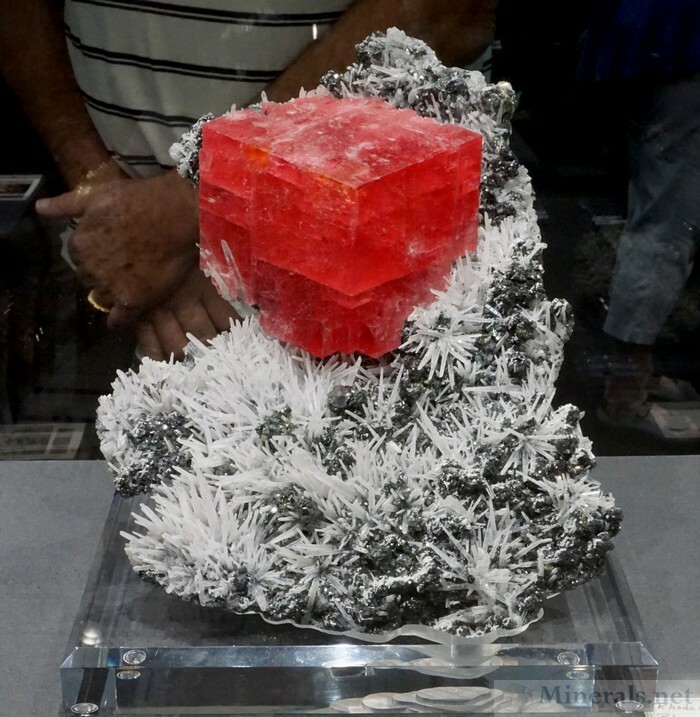 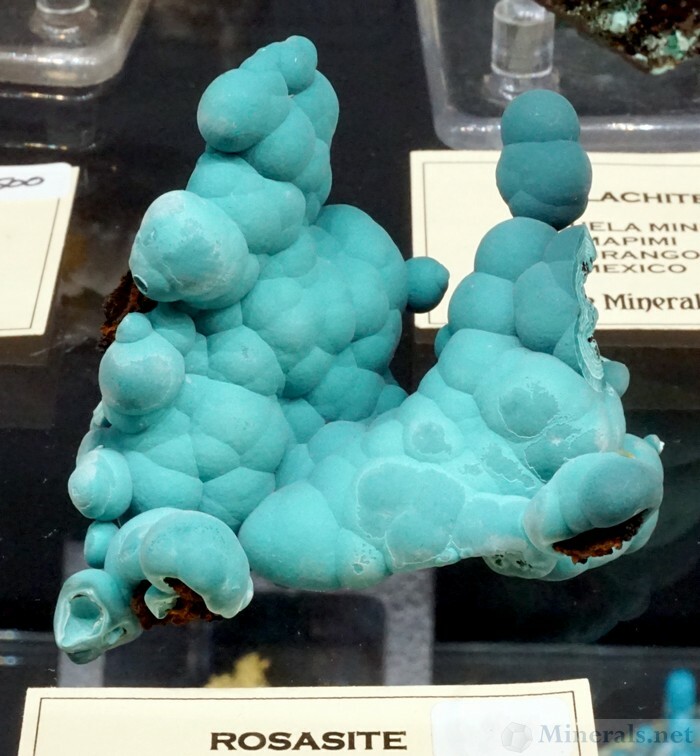 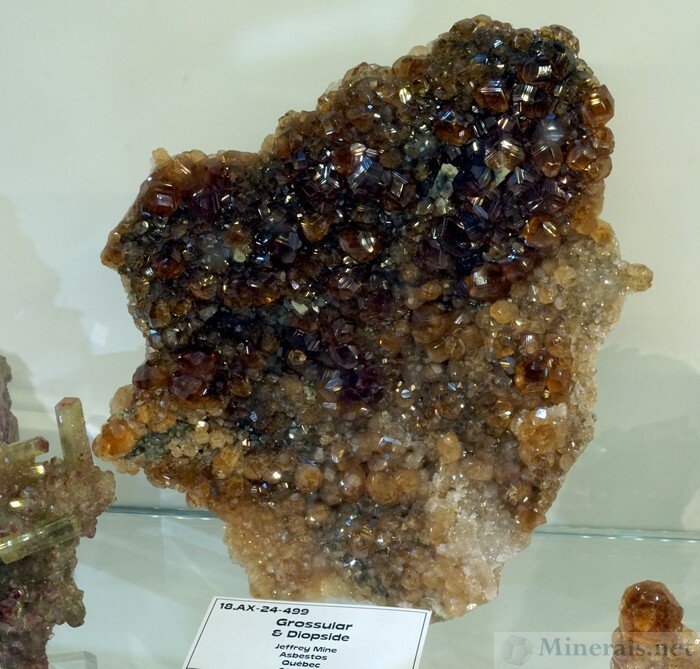 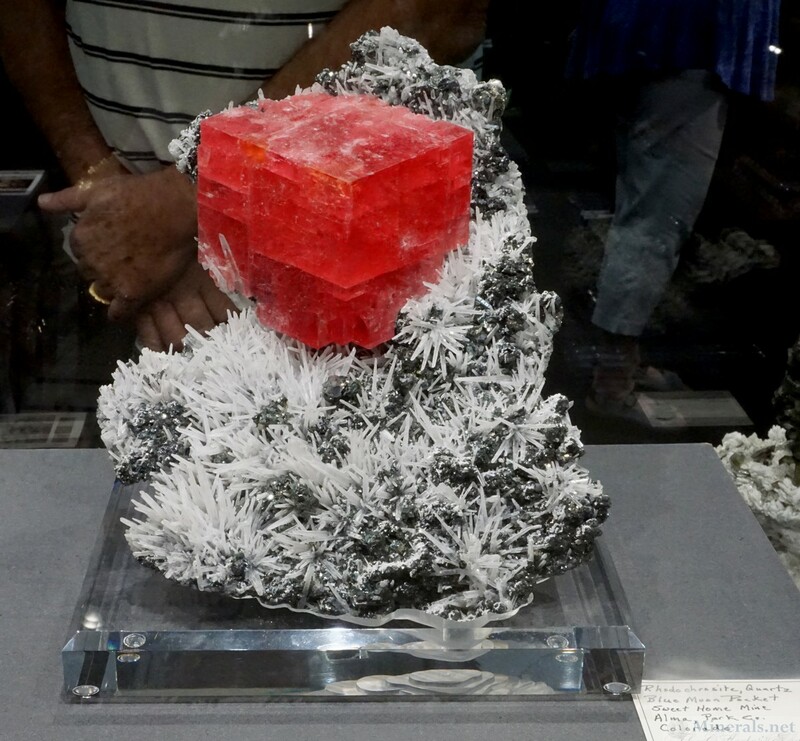 This post is a continuation of the previous post, showing some of the individual minerals from the exhibit displays of the 2018 Tucson Gem and Mineral Show®. 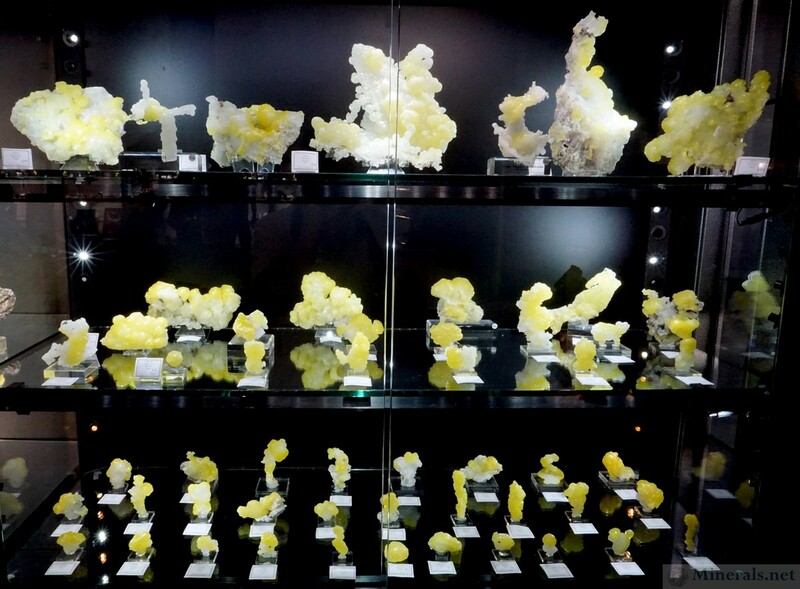 These are individual minerals from private collections.